Muse are unlike any other band recording and performing today. And having watched them perform at Oracle Arena last night, they are most definitely a band that needs to be experienced live in concert. 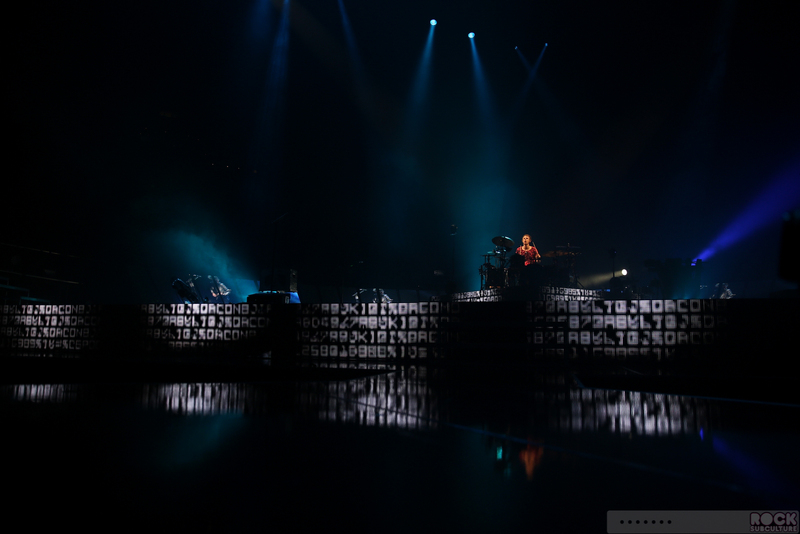 It’s as if the band, and their music, is designed to be performed live in front of thousands… and having been to a great many concerts in my time, I would rate their stage production itself in the top three I’ve ever seen. 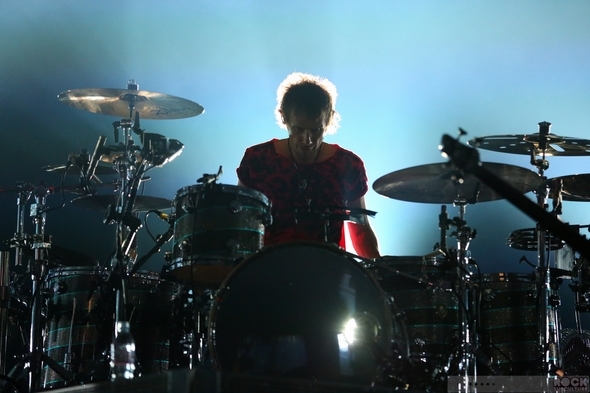 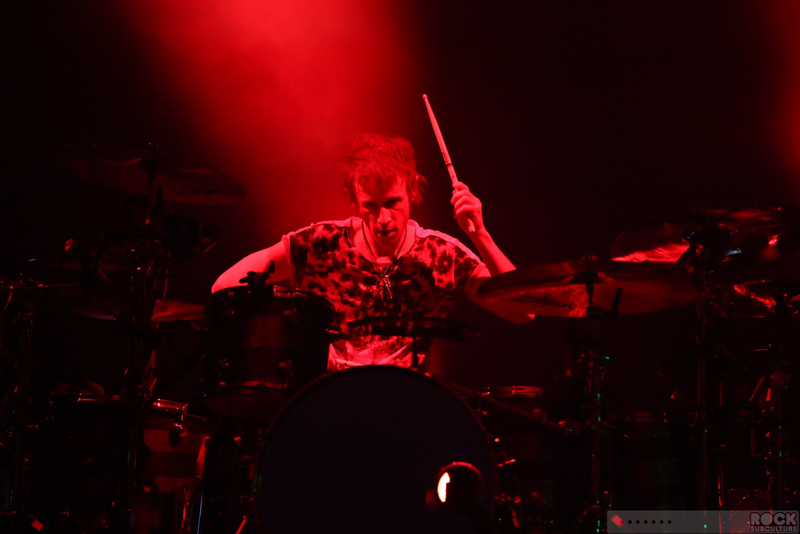 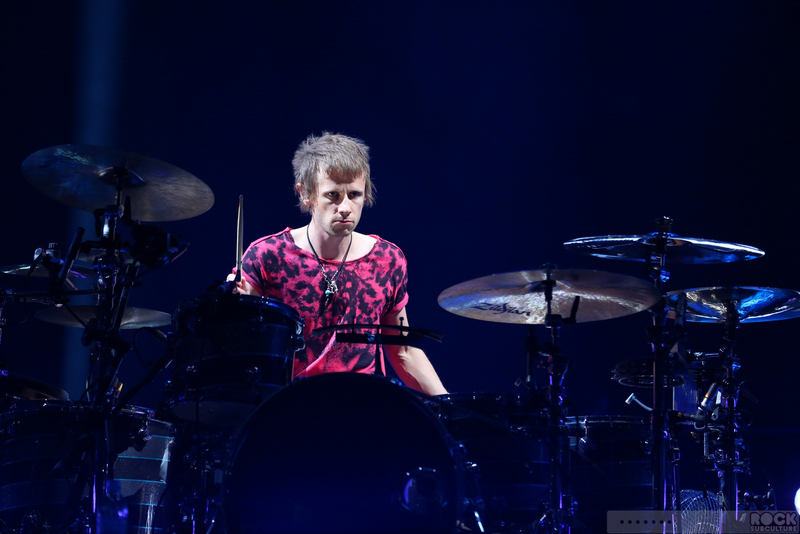 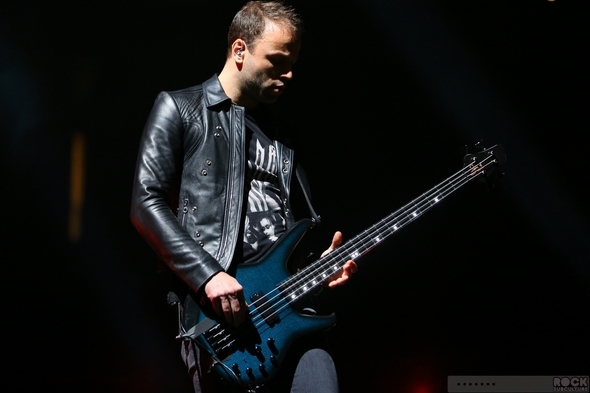 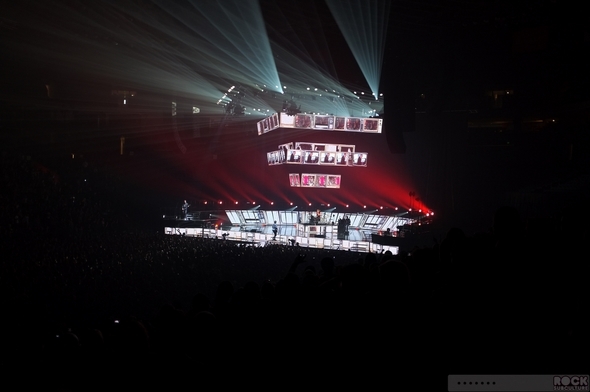 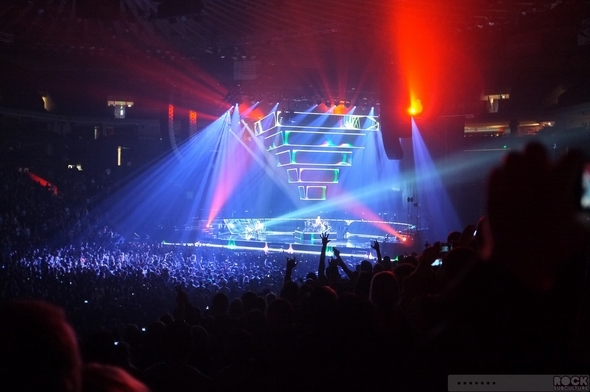 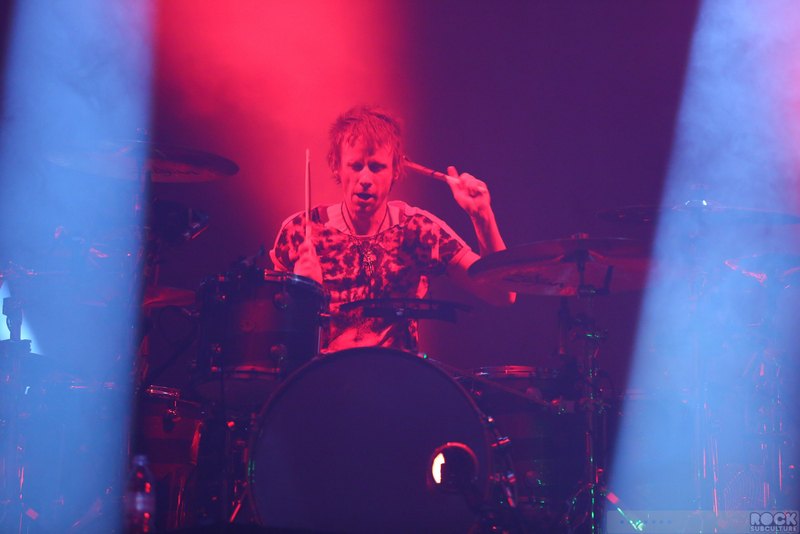 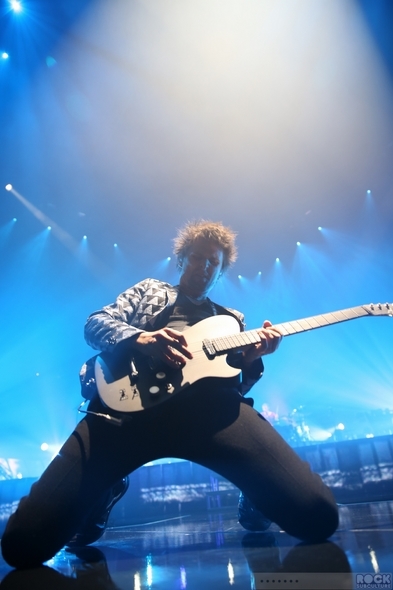 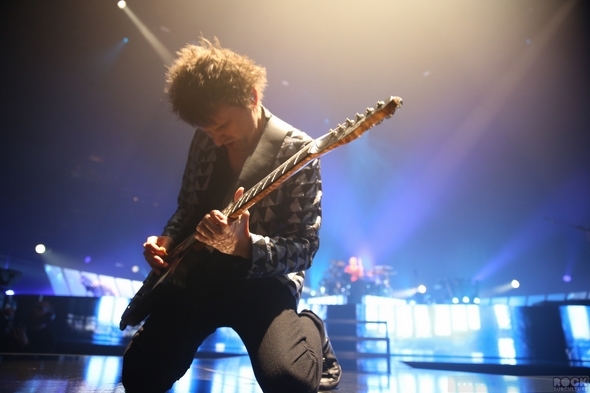 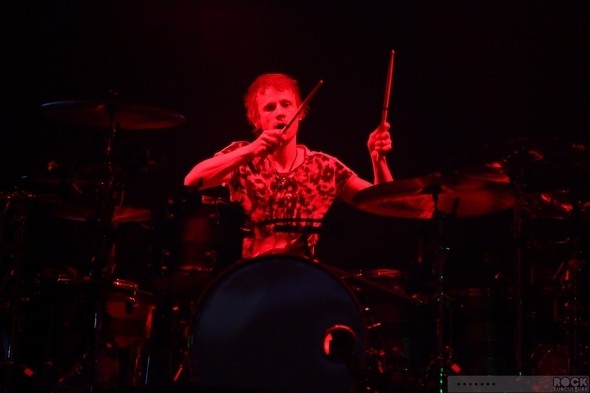 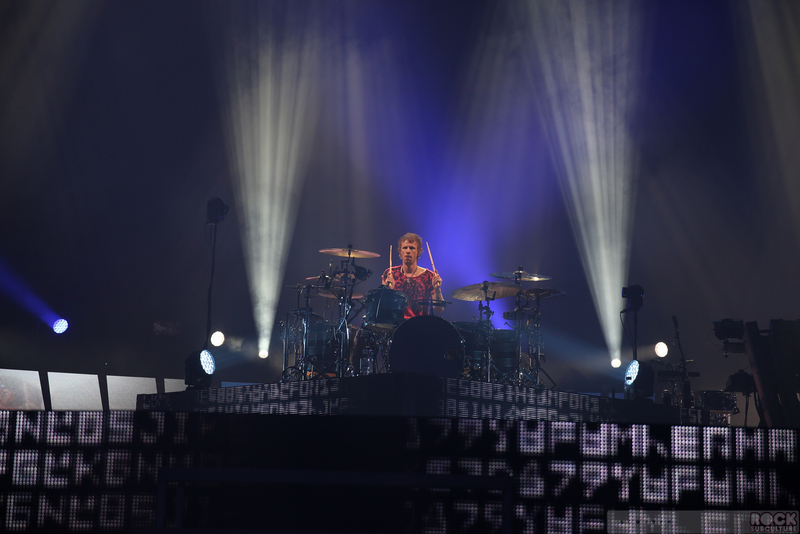 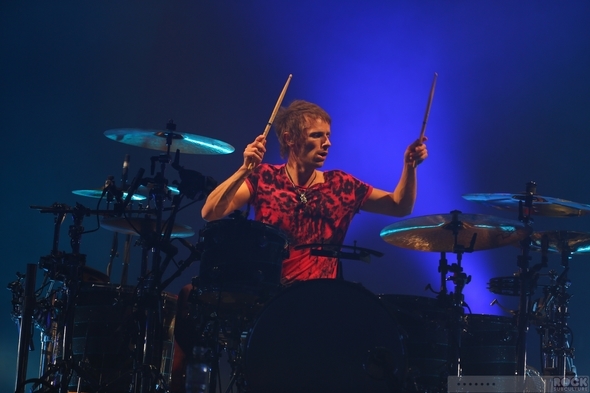 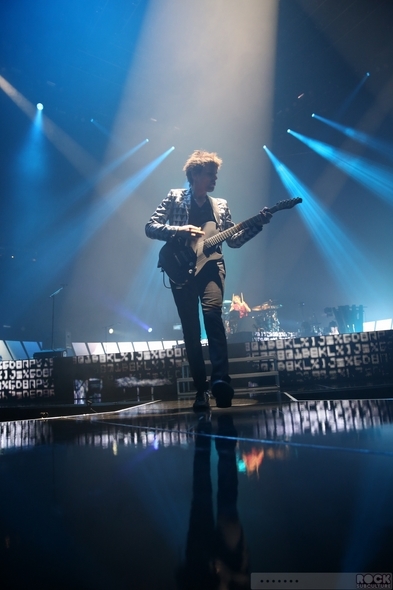 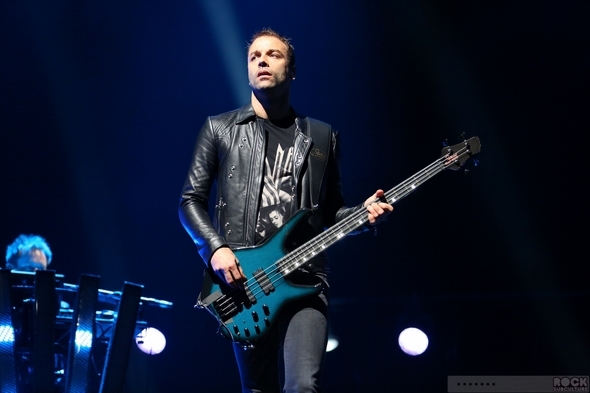 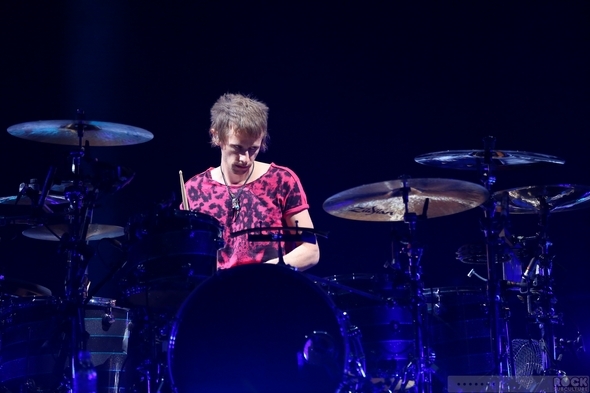 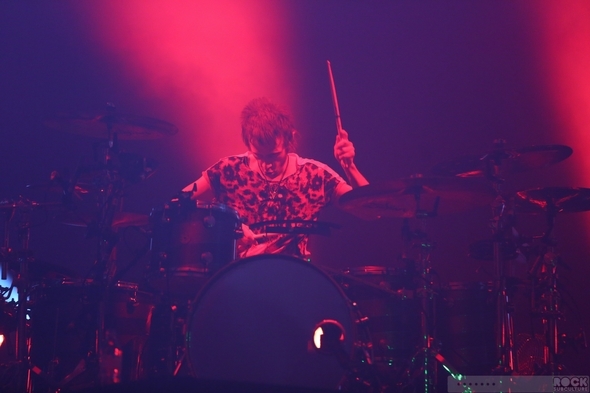 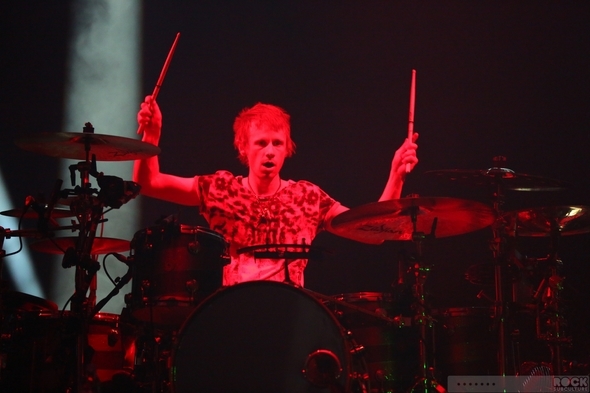 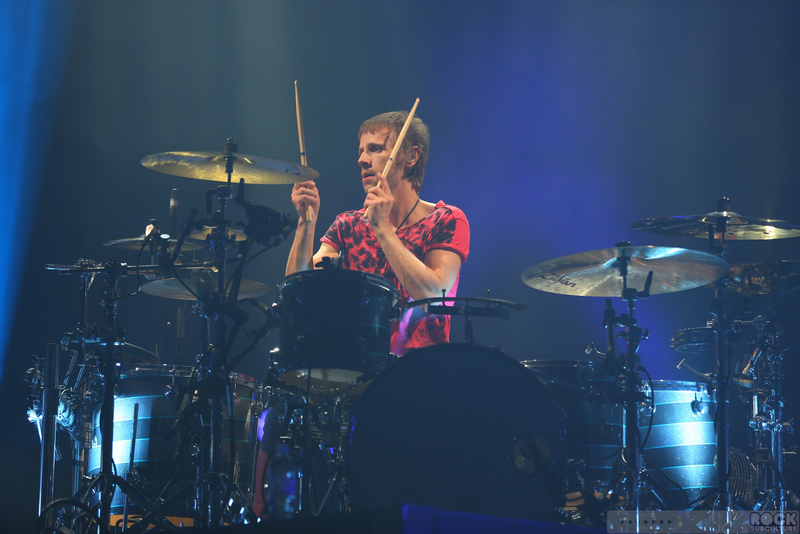 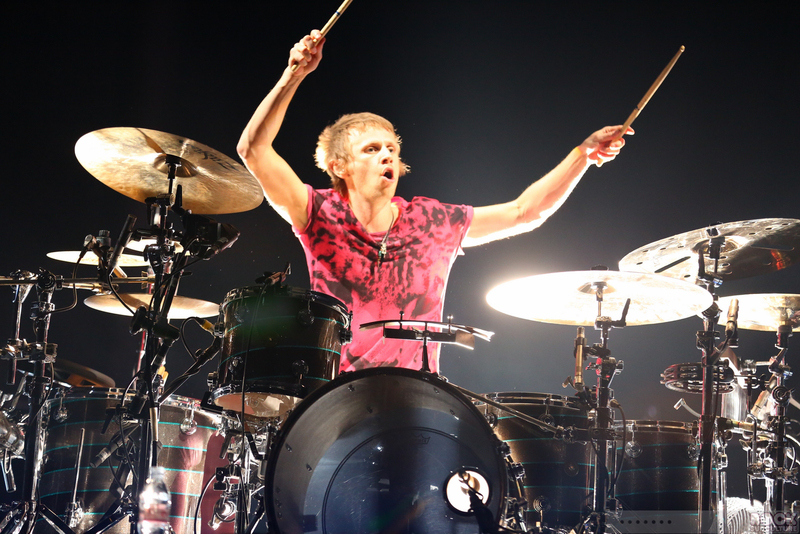 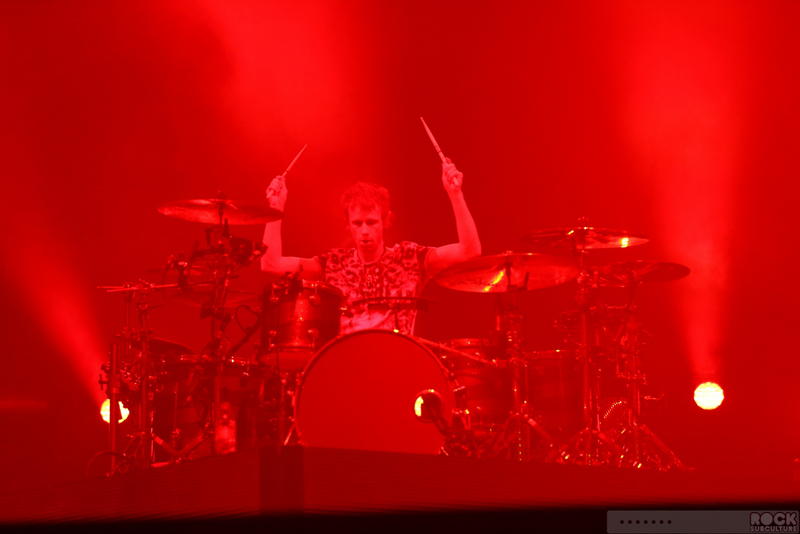 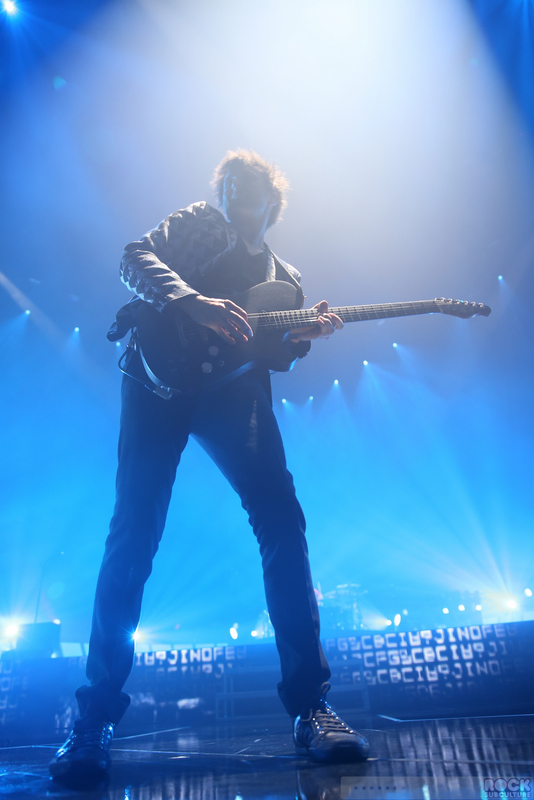 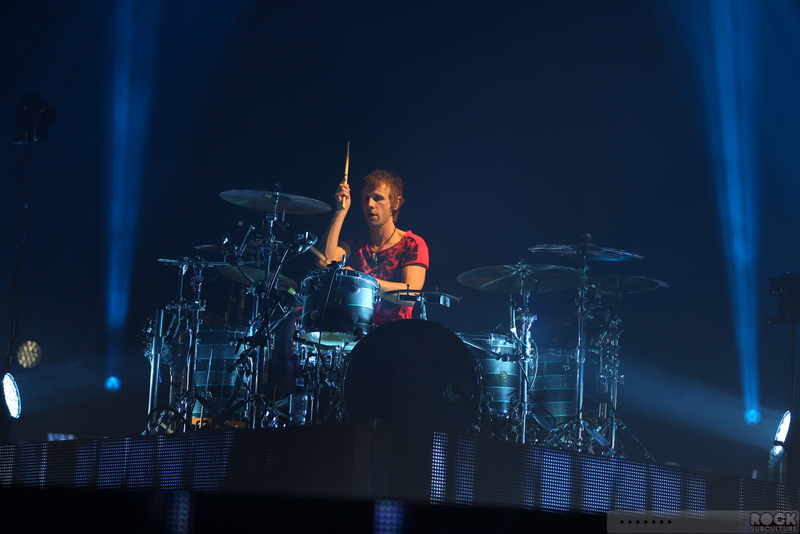 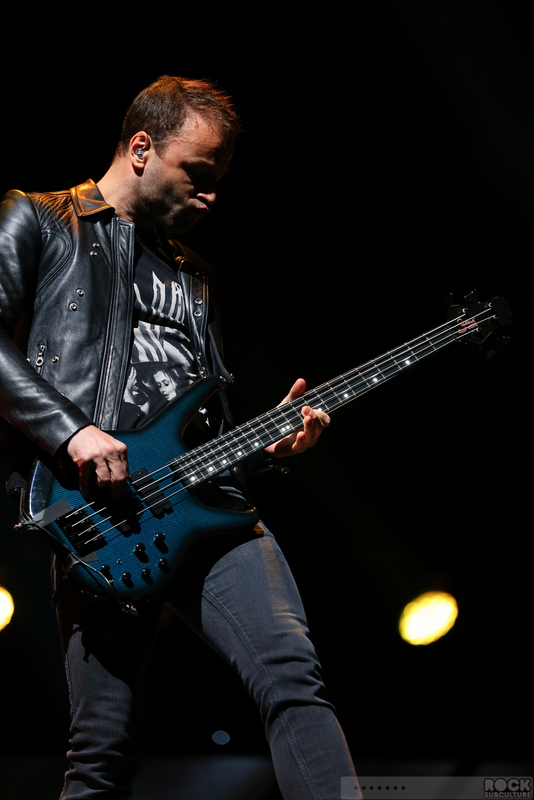 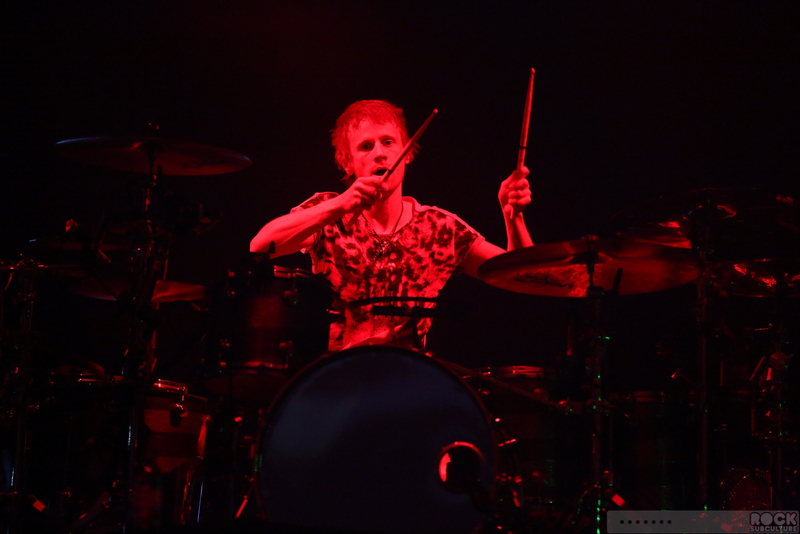 It is nothing short of stunning, with video monitors all over the stage, as well as a transforming pyramid that plays both pre-recorded as well as live footage of the three principals in the band – Matthew Bellamy, Christopher Wolstenholme, and Dominic Howard. 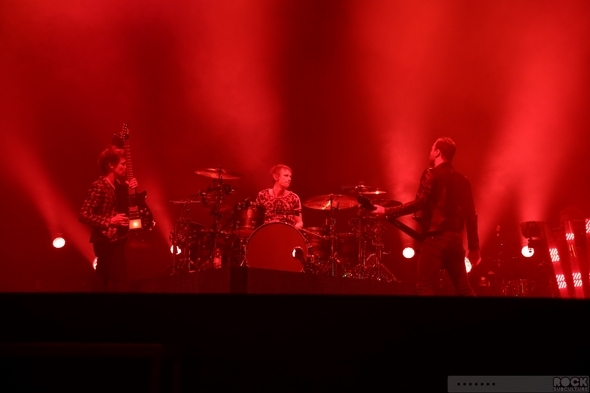 And not your standard “passable” live video to help out the fans in the cheap seats, but the highest quality I’ve seen, and presented in a frenetic and artistic fashion. 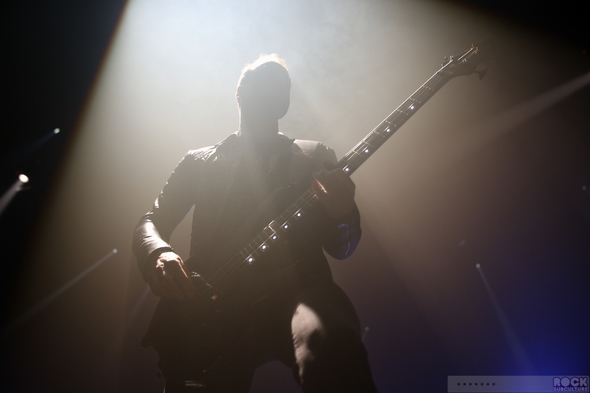 Of course, none of this would matter if not for the music… and the band totally kills it on stage, fully reproducing their completely unique sound and anthemic, futuristic, genre bending mixture of alternative rock, electronic, heavy metal, progressive rock. 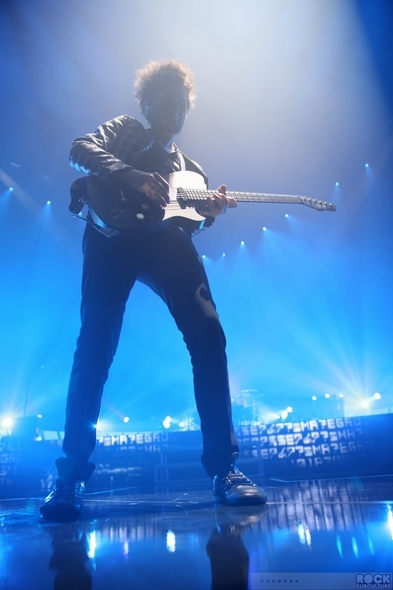 Though it is only January, I am confident that this will be one of the best tours of 2013, showcasing many tracks from one of 2012’s best albums, The 2nd Law. 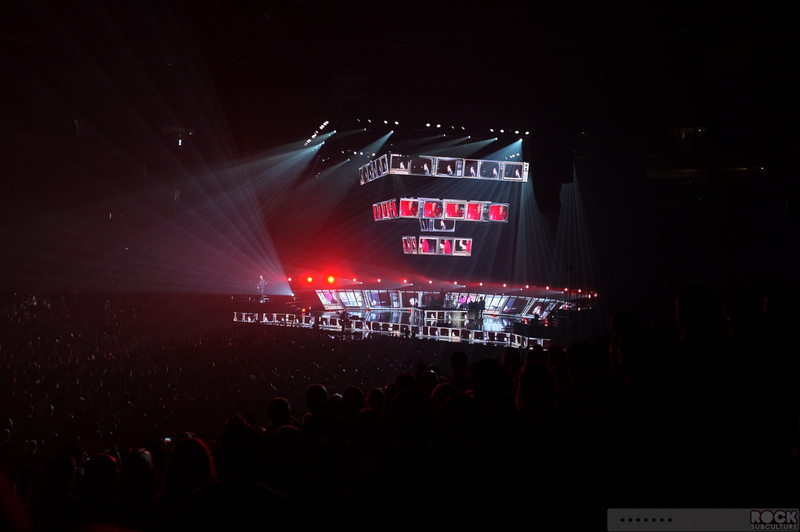 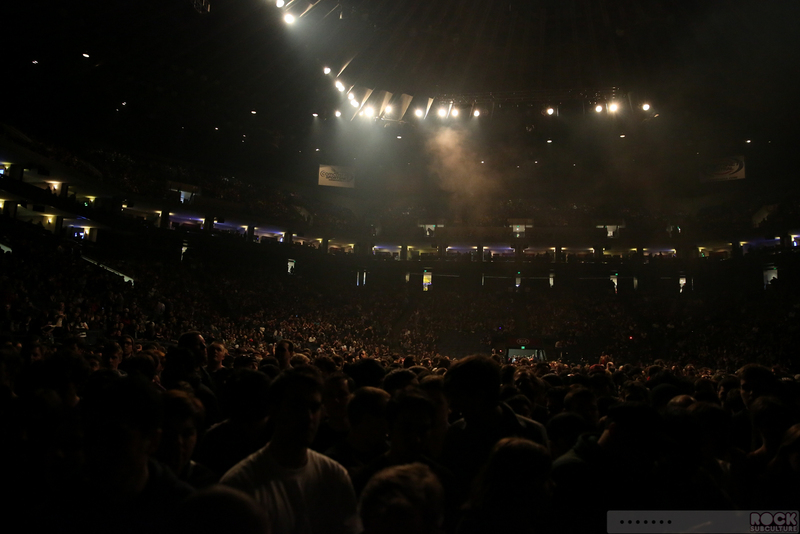 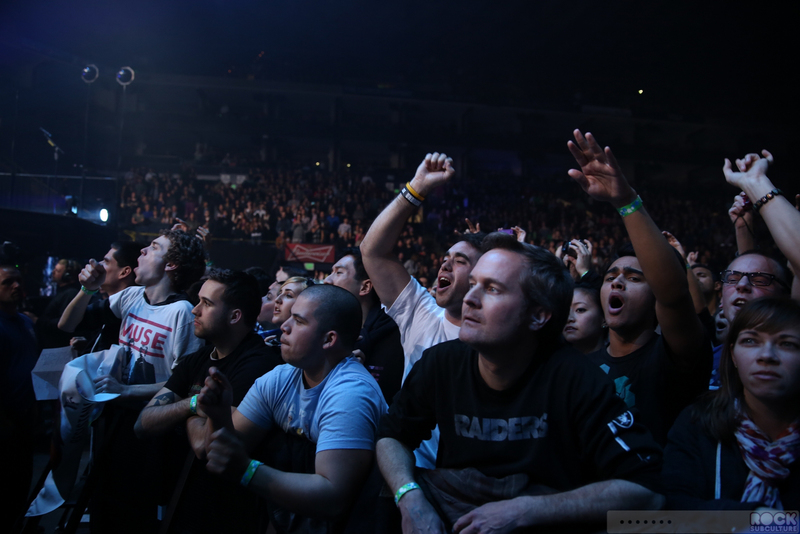 Presented by Goldenvoice with Another Planet Entertainment and support Live 105 as well, the show took place at Oracle Arena in Oakland. As a general rule, sports-style indoor stadiums are not my favorite type concert venue. 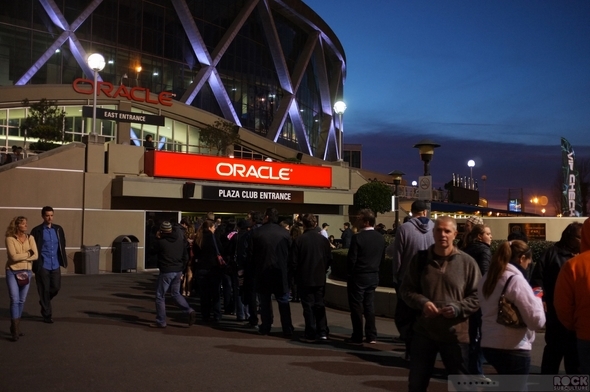 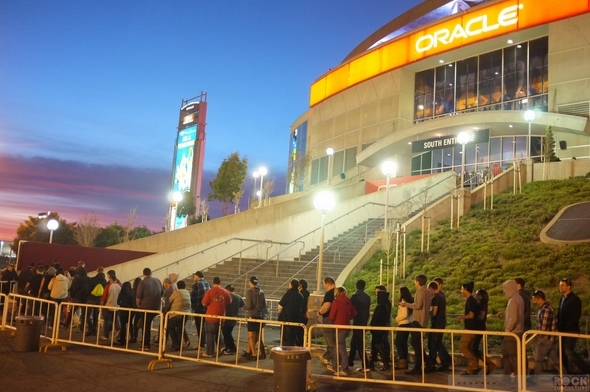 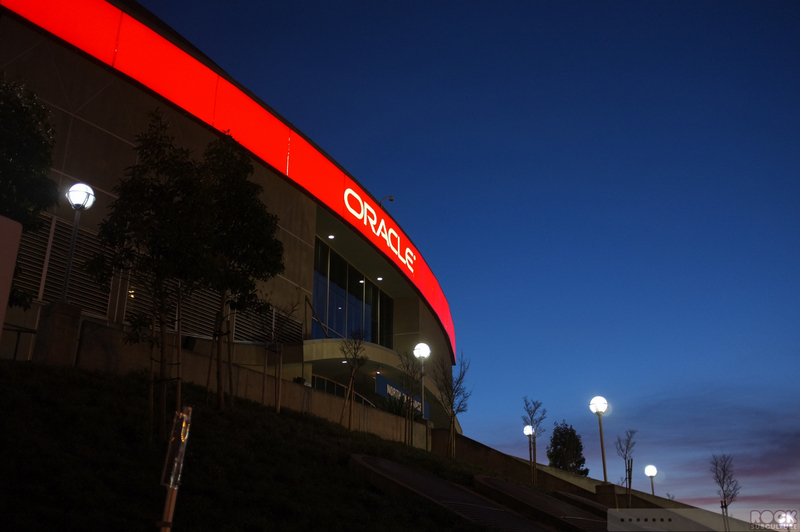 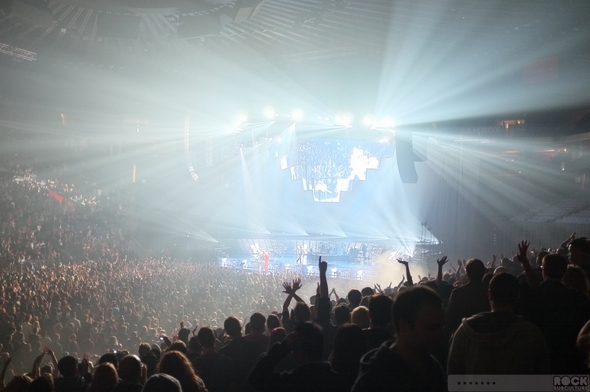 Having said that, I think I would rate Oracle Arena at the top, and wouldn’t hesitate to recommend seeing a show there, as they have evolved past many of the pitfalls one might encounter going to a show at a sports stadium. 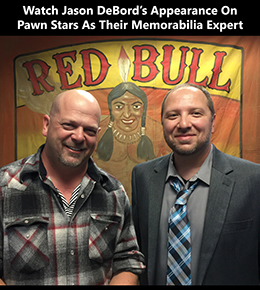 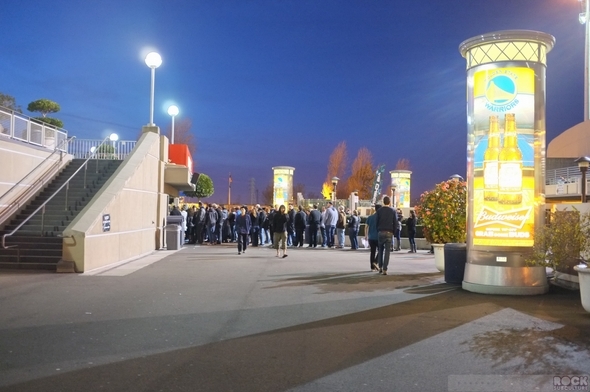 It is very well managed and the staff is excellent. 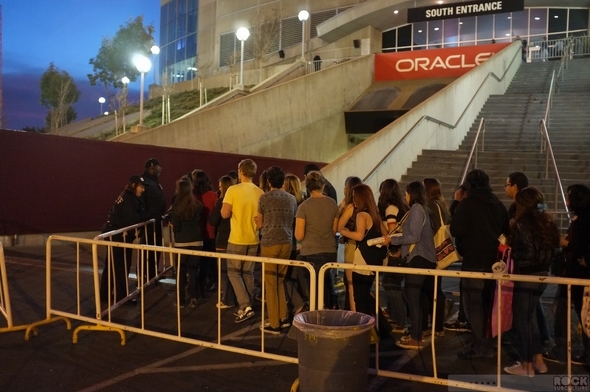 I had a friend who arrived at 8am this morning to make sure he could be front row in the GA pit for the show (the whole floor for this show was general admission), and the venue not only allows fans to line up, but it is a very orderly and fair process. 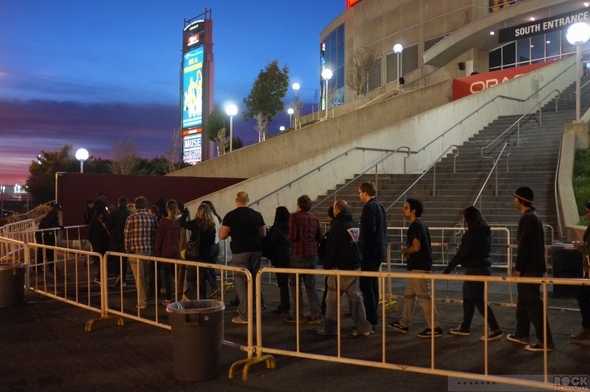 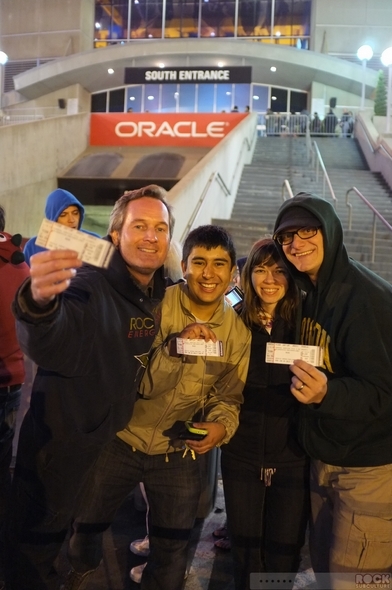 At many venues, lining up for GA shows can be disastrous. 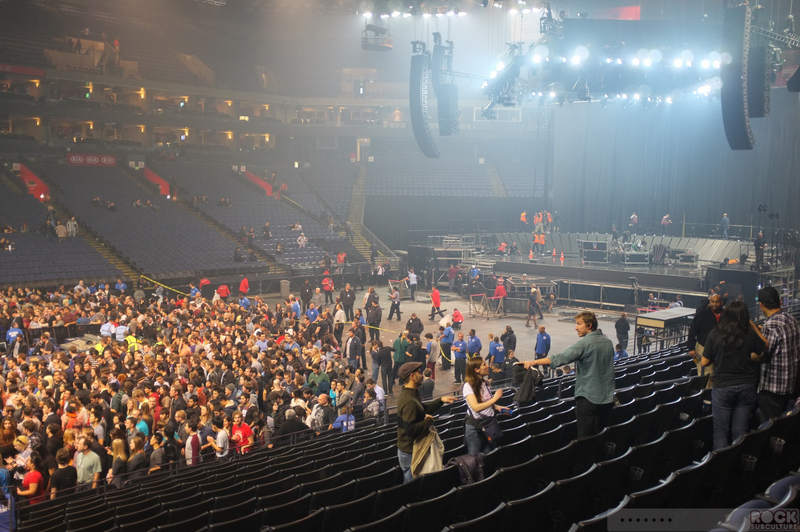 I was talking with my friend at the time doors finally opened, and it was the most orderly process I’ve seen (and it is great that they have the fans sit on the floor once they pick out their spot, and helps keep things safe and fair for everyone. 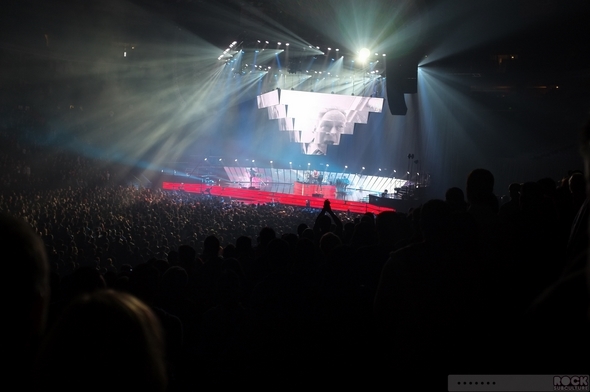 All in all, everything is well run, they don’t sell the “bad” seats (with obstructed view), and the sound is excellent. 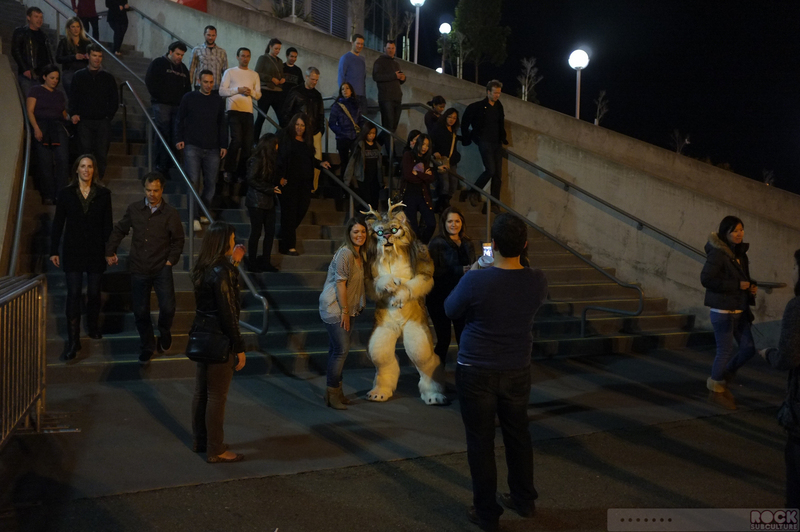 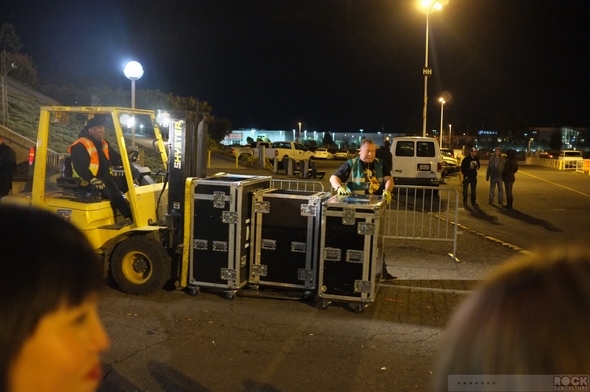 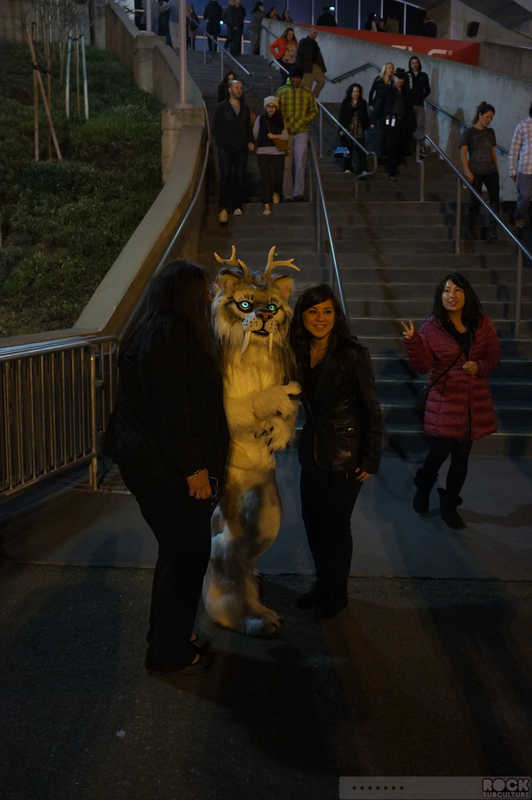 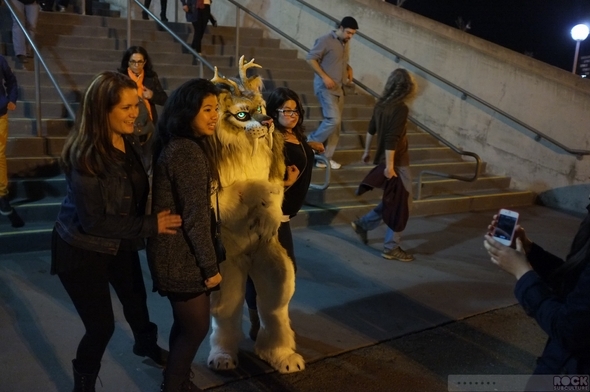 After the show, the venue staffers are extremely helpful and get the place cleared out fast but in a friendly and respectful manner, and the parking lot is designed well enough that cars flow out quickly. 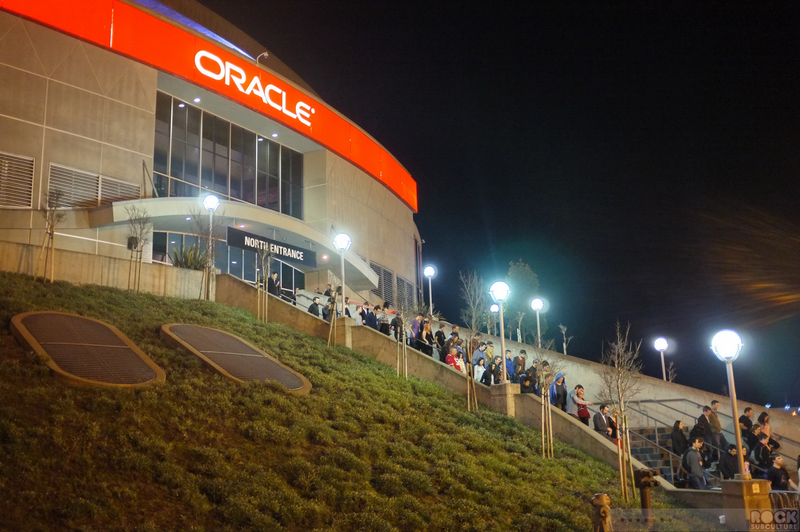 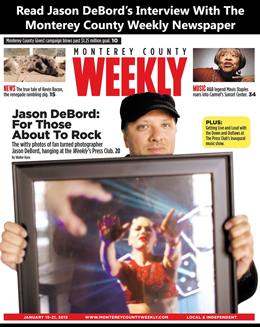 All of this is a bit of an aside, but I like to give kudos when they are deserved, and Oracle Arena is a great venue for live music concerts. 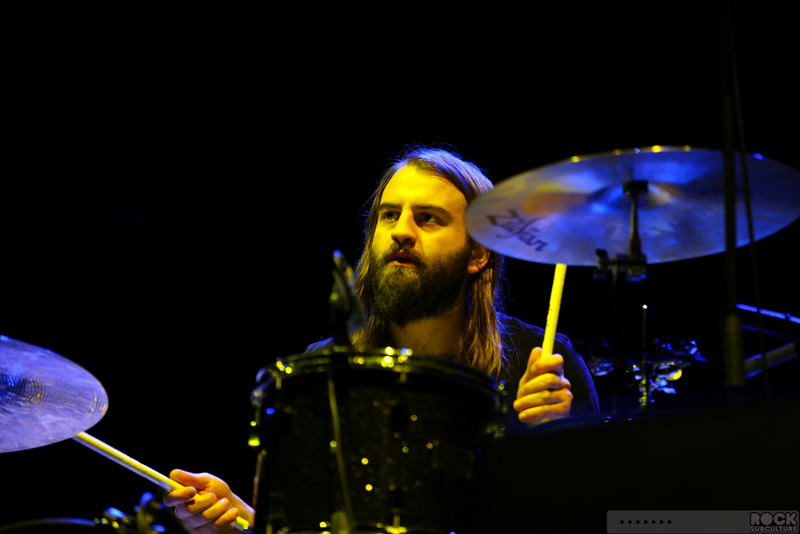 British alternative rock band Band of Skulls opened the night for Muse, and their music is a nice compliment to the headliners and kicked things off nicely. 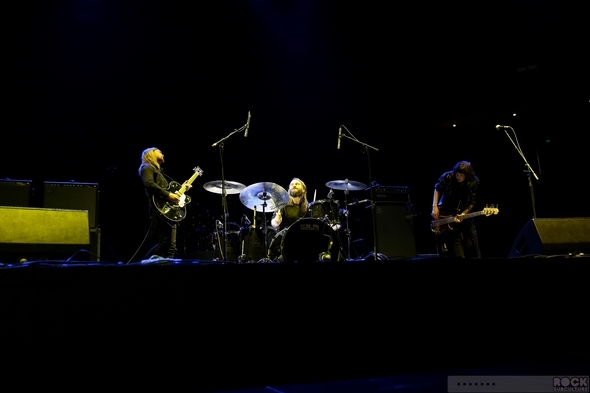 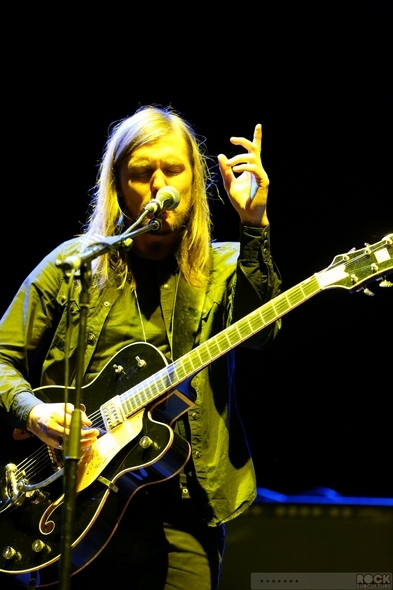 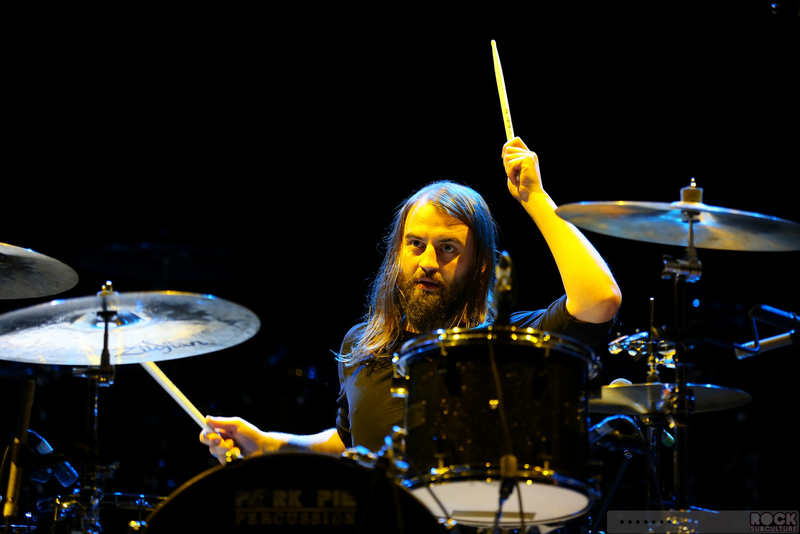 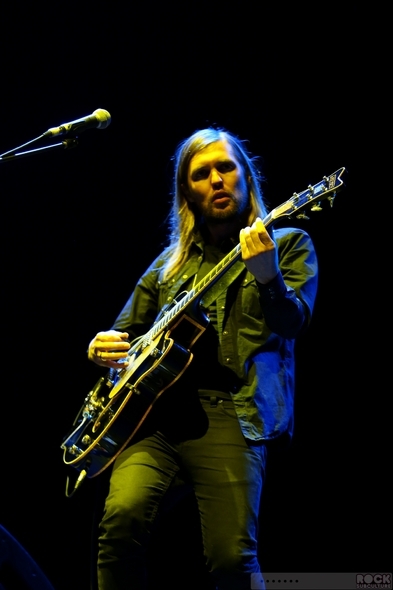 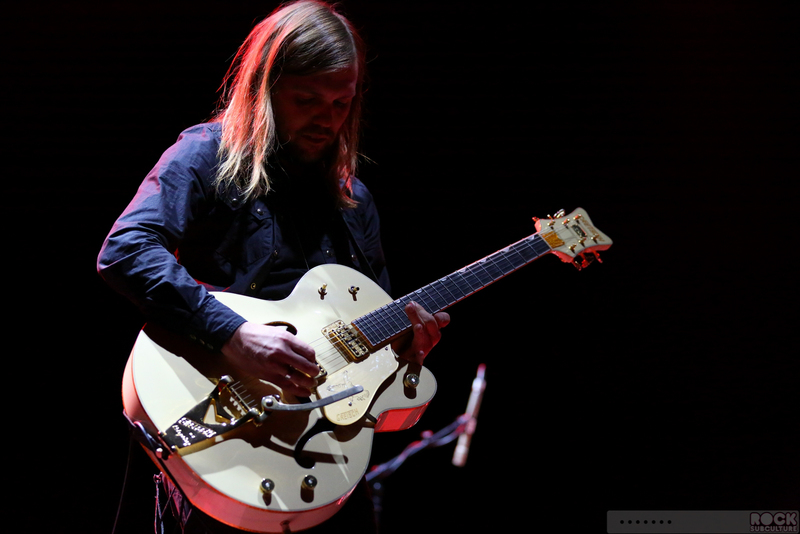 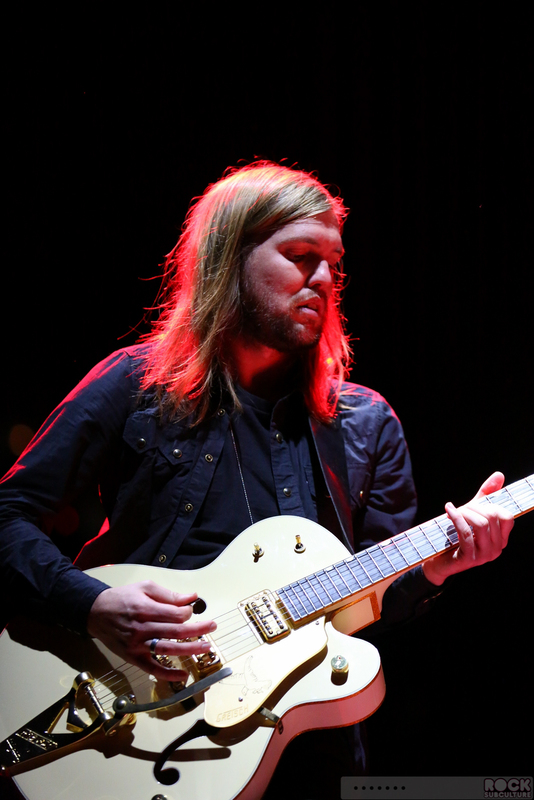 The band released their second studio album, Sweet Sour, last year. 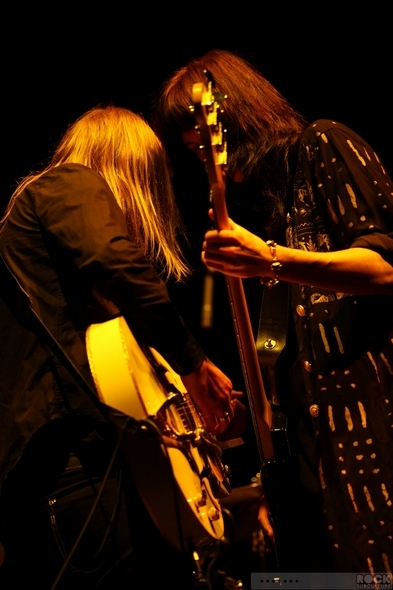 They did a short set of about six songs. 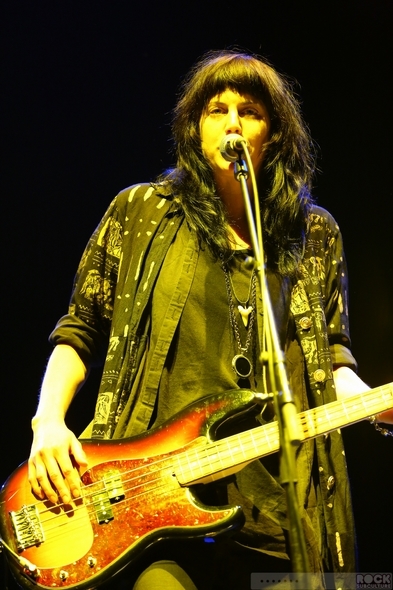 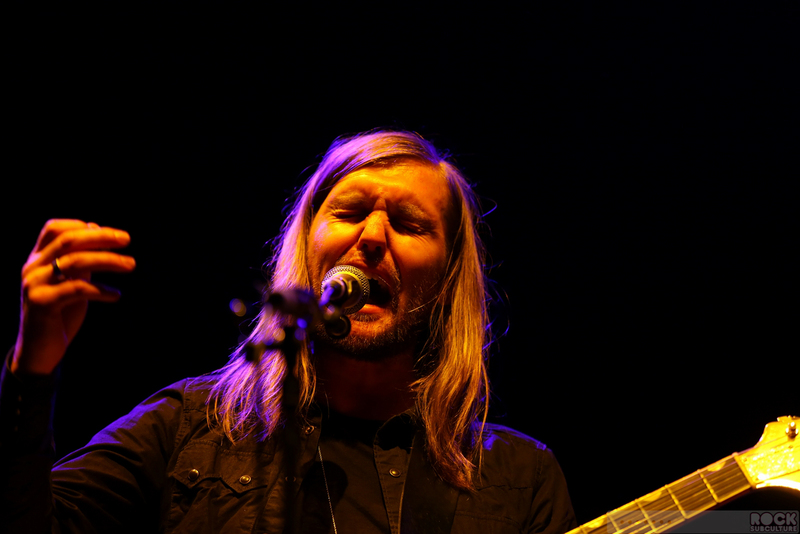 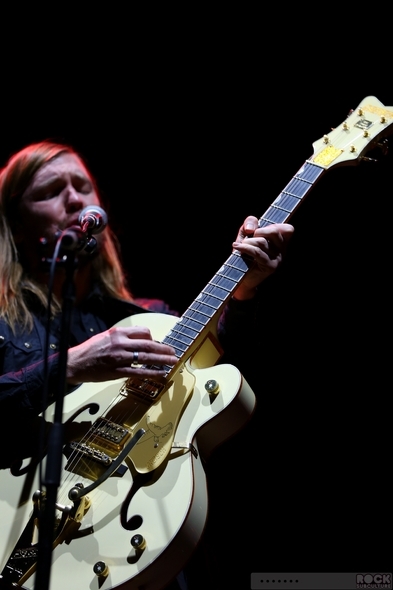 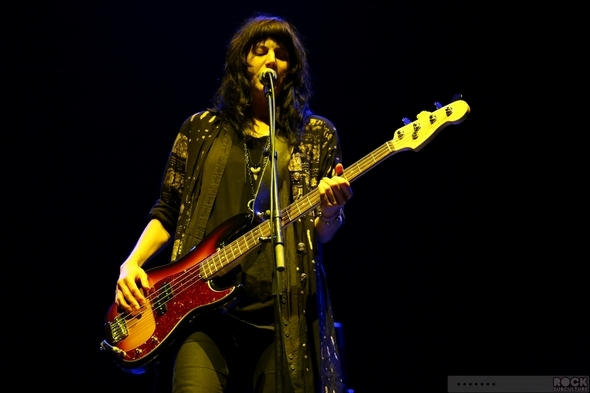 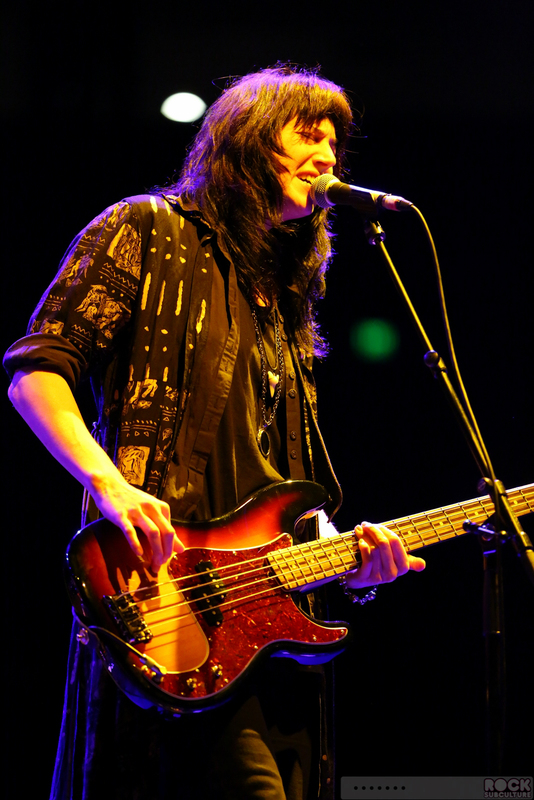 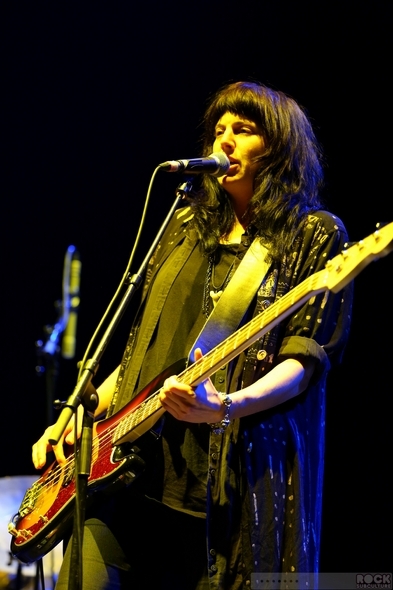 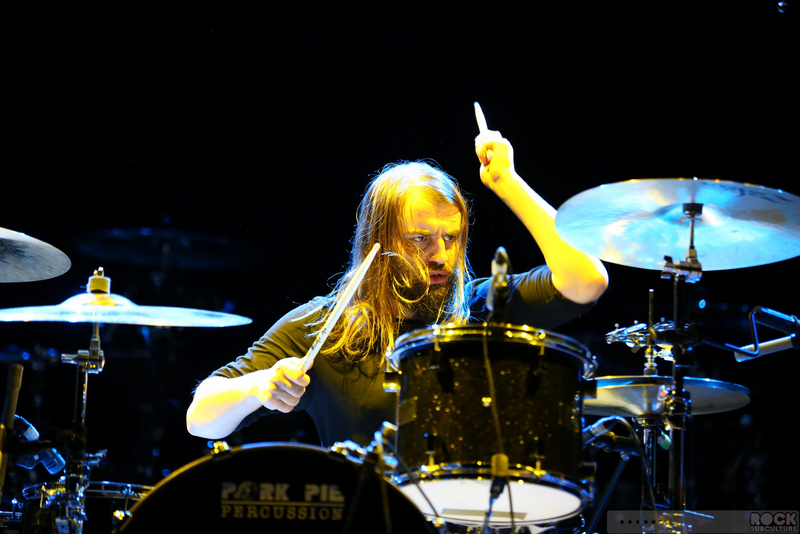 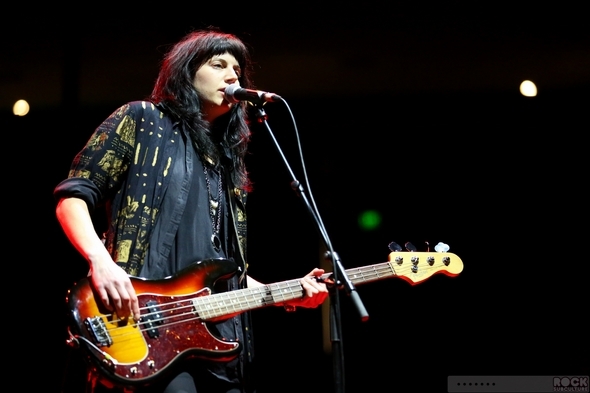 A three piece band, guitarist Russell Mardsen and bass player Emma Richardson trade duties on vocals, though Russell took the lead on most of the songs. 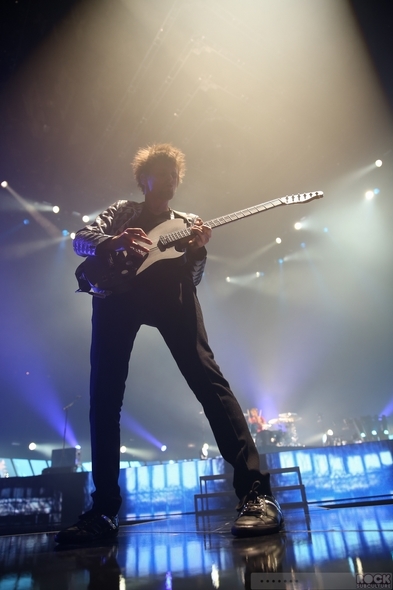 One of the most interesting things about Muse is that they are somehow nearly universally recognized as a “cool” band, by people who are fans of all variety of genres of music. 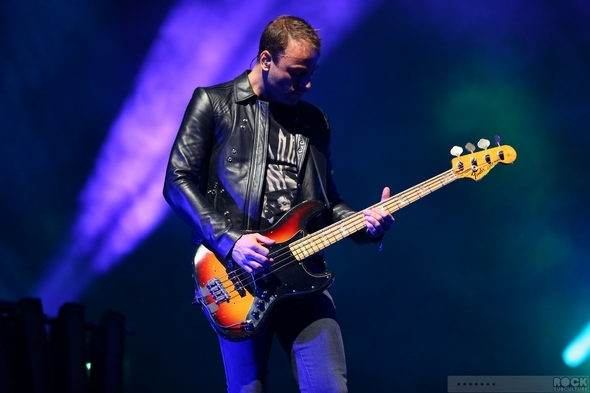 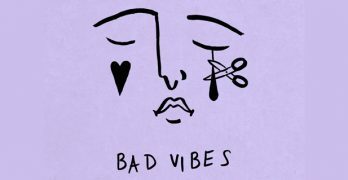 There’s just something about them… for me, they come across as the musical equivalent of Quentin Tarantino, except in the pop and rock music world. Because I have to imagine that the band are true and dedicated students of all music, because they have an uncanny ability to identify unique and compelling ideas and sounds and concepts and twist them into something all their own. 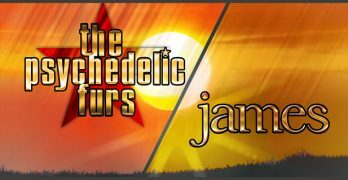 I can’t believe all this musical genius comes from nothing, and they seem to have an innate sense of what sounds both compelling and unique, tried and true yet reconfigured into a different… something… altogether – something experimental but with cues and fundamentals that are somehow familiar, but maybe from another world or dimension all the same. Like some band from the far future, coming back to our time to show us how its all changed and evolved into something we can instantly, impulsively appreciate and connect with, but never fully understand. Though the band formed in 1994, their increasing mainstream appeal came much later outside of their home country of England. The band has always been pretty prolific, and as time has gone on, the rest of the world seems more interested in taking the ride and catching up. 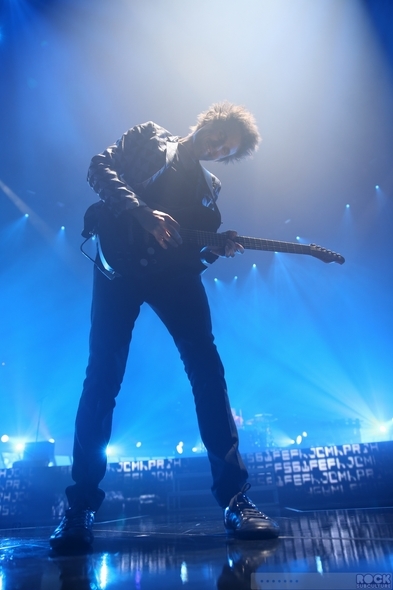 While each album has become both more sophisticated as well as more assured in evolving their own unique sound, it is my own personal opinion that they simply get better and better with each album. As noted in my 2012 Year In Review, I rated their sixth studio album, The 2nd Law, as one of my own top ten albums released last year. 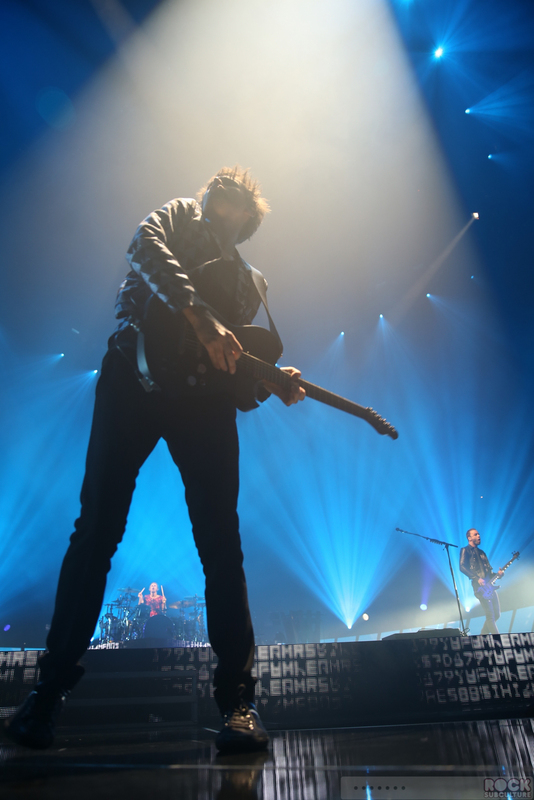 Muse have increasingly made music that feels like it is made to rock stadiums, and with The 2nd Law, it’s hard to imagine them pushing that any further. 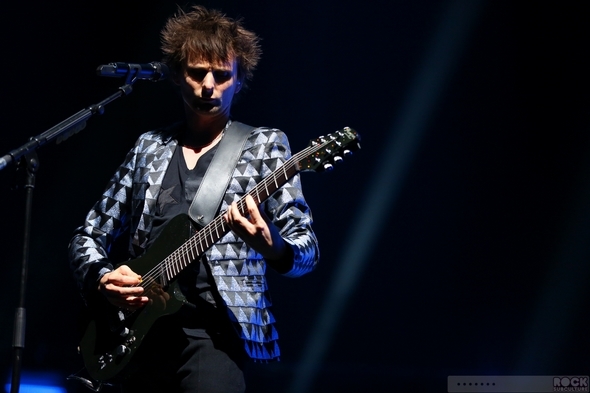 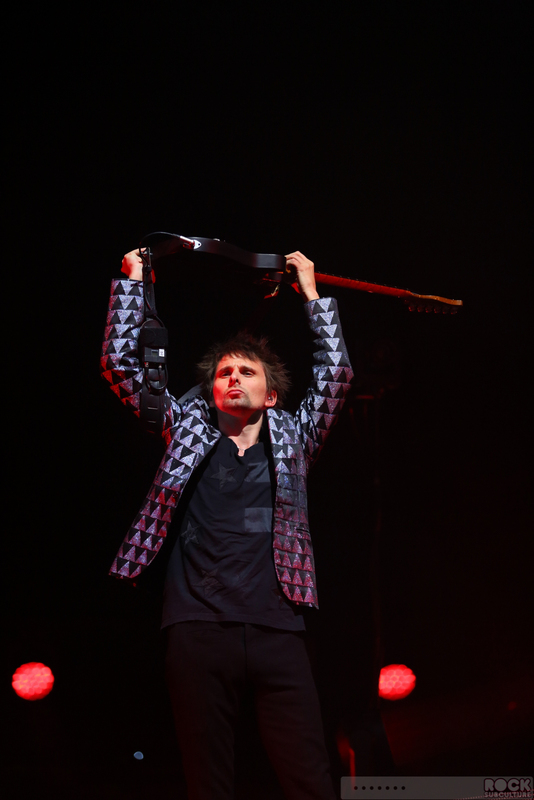 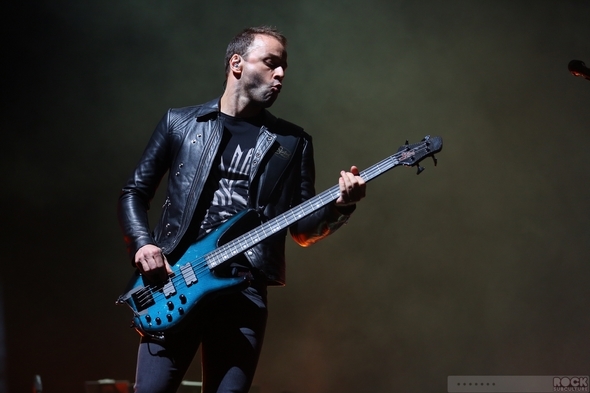 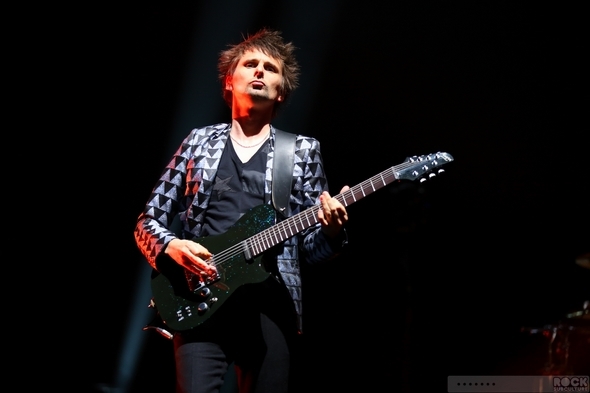 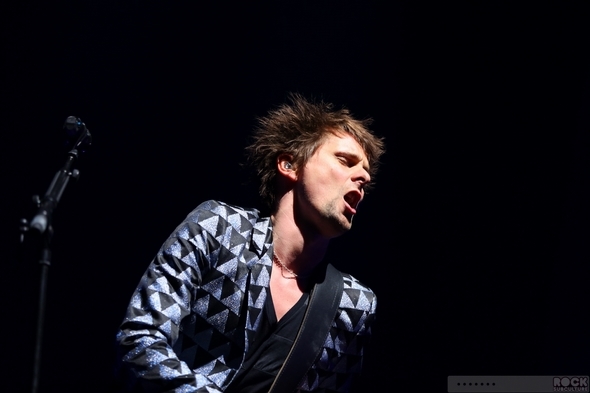 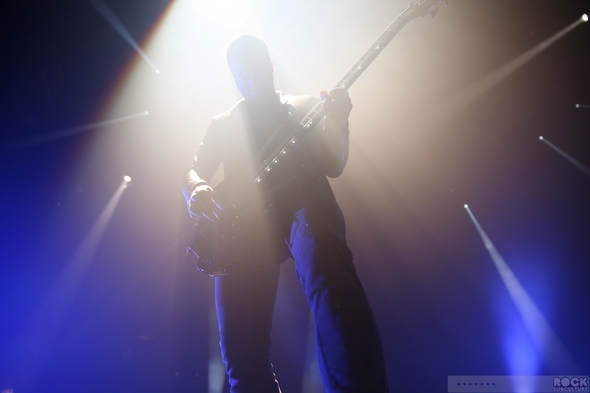 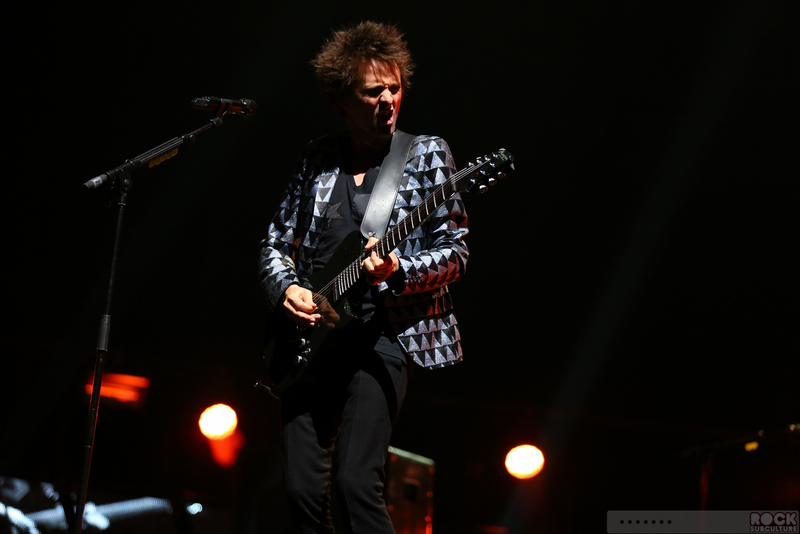 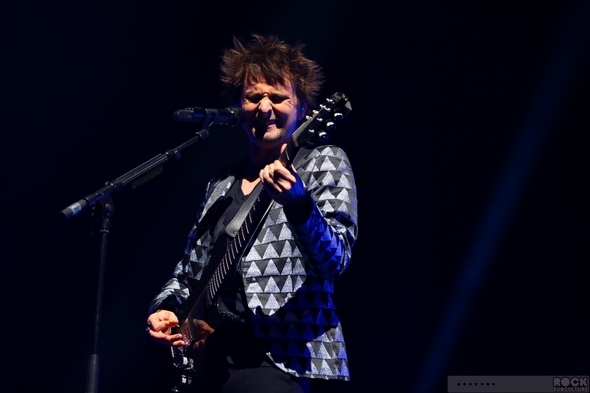 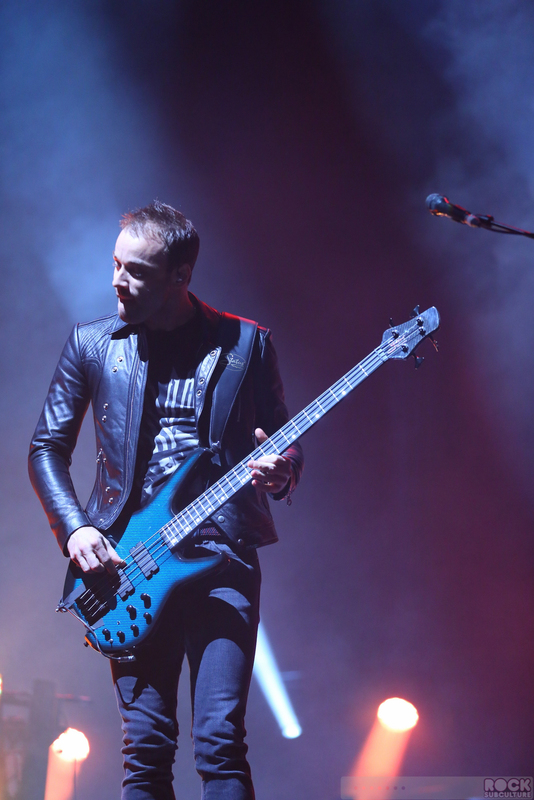 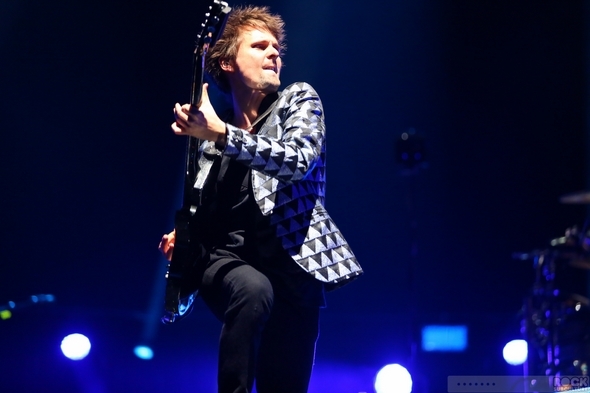 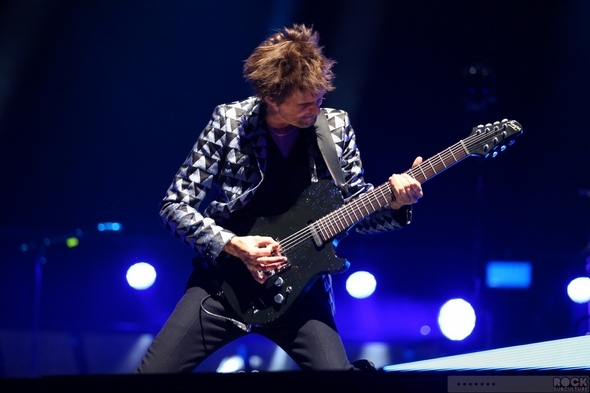 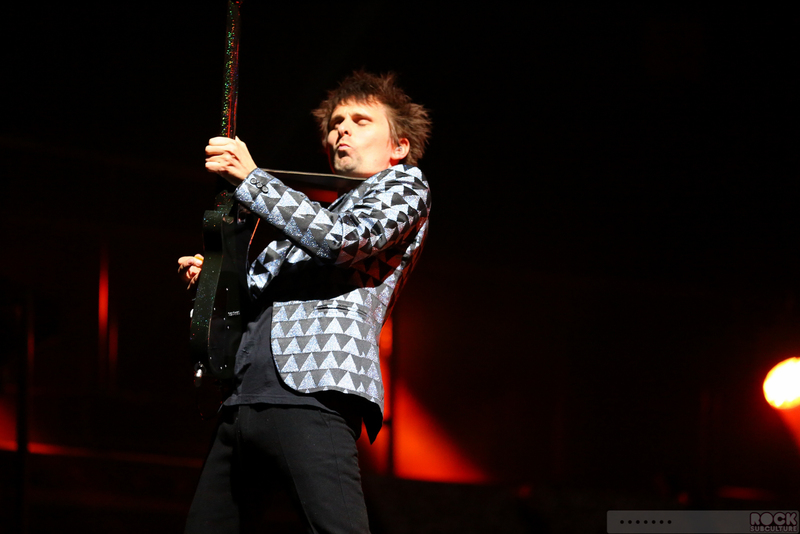 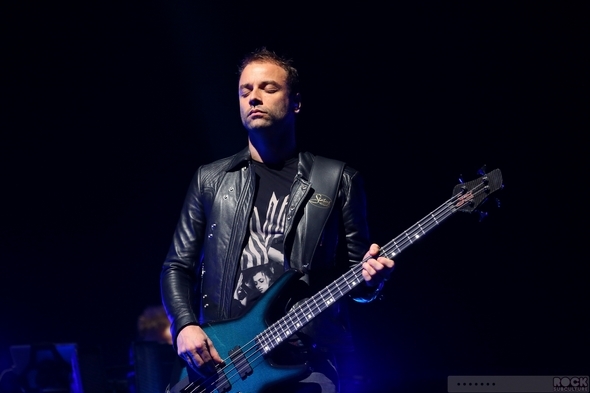 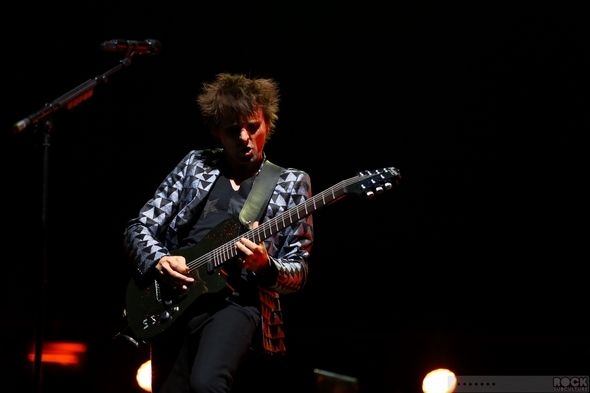 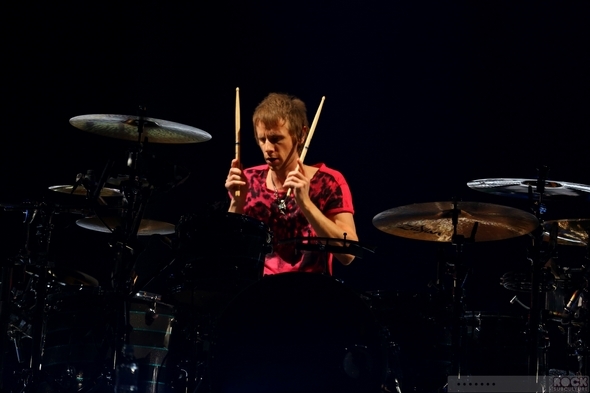 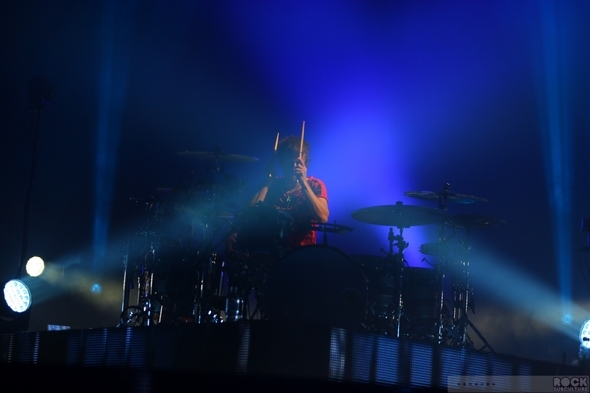 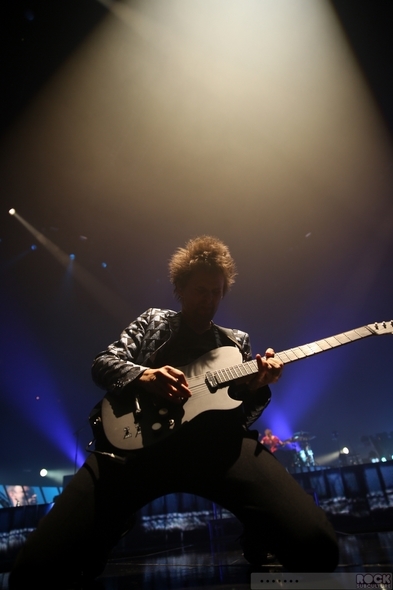 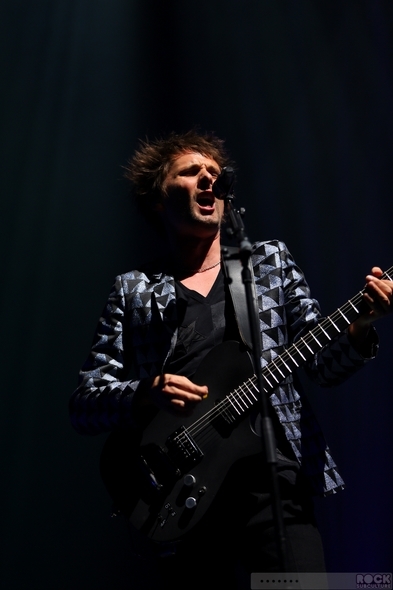 The opener, “Supremacy”, comes across as a Muse anthem on Queen and James Bond theme steroids, with a tinge of electronic guitar distorted Mighty Mouse theme song in the mix. 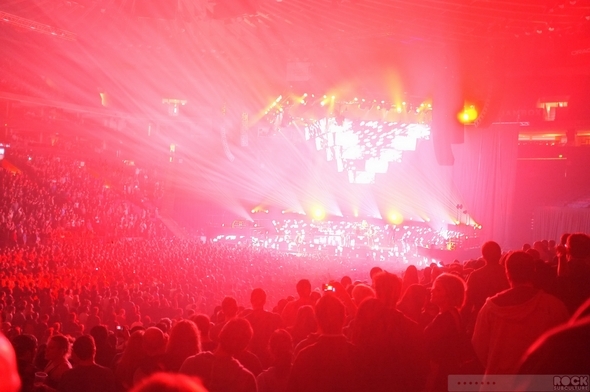 But it’s really a bold statement, and if this doesn’t make people stop with the Radiohead comparisons (which I’ve never gotten at all), I’m not sure what will. With no more “up” to go, the album drops down into some kind of dubstep dance track with the first single, “Madness”, which is an awesome song in that it shows how far the band can stretch their trademark sound and explore different corners of popular music. 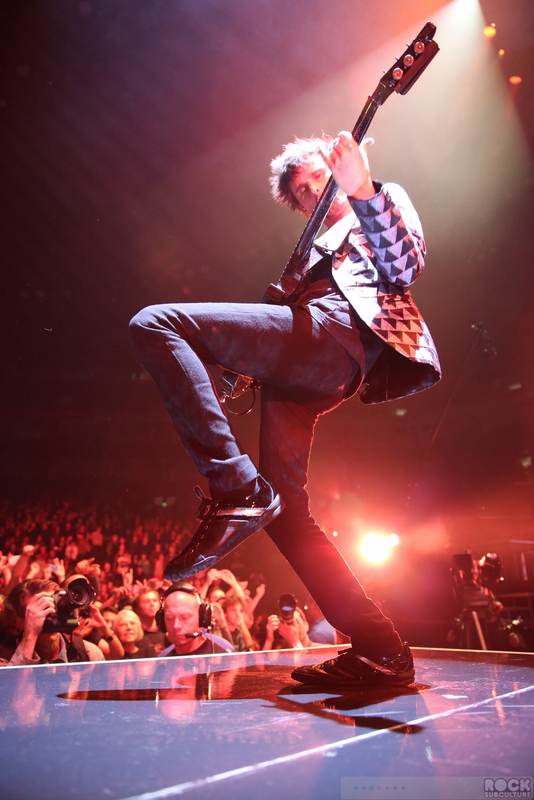 Muse just sounds like Muse, and they don’t seem to be interested in just recreating past hits, but delving into new territory. 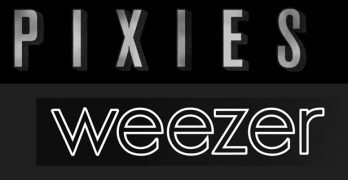 The whole album is like a giant alternative electronic rock orchestra, or the soundtrack to some film that can’t be made for another decade or two. Matt Bellamy isn’t the most versatile male vocalist in music today, but what he lacks in range and gymnastics he more than makes up for with character and emotion and vulnerability. Nor does he have the need to sing over every moment, allowing the songs to breathe on their own, and revealing their innovative compositions and sounds, as well as both harsh and soft moments to come alive and build. 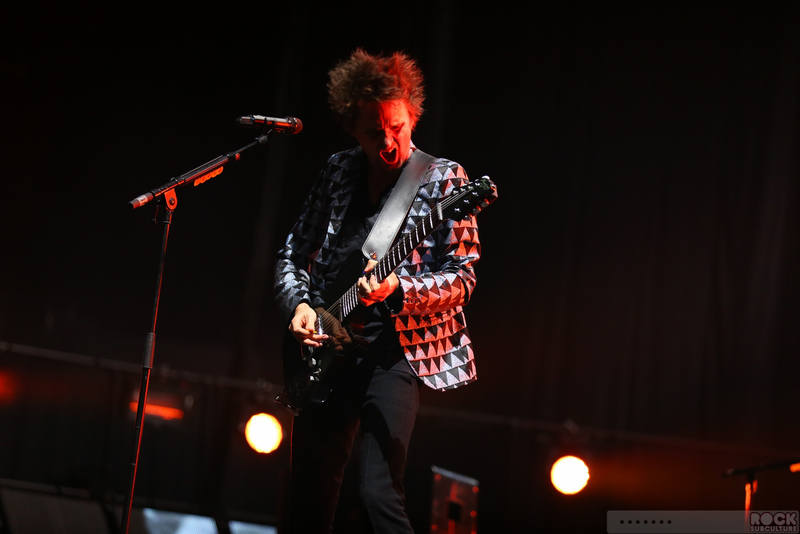 My one regret in my year end review is that I did not count “Panic Station” from the album as one of my top ten songs of the year as well. Had I more time to listen to the album before year end, not only would “Panic Station” made that list as well, it would have been near the top. 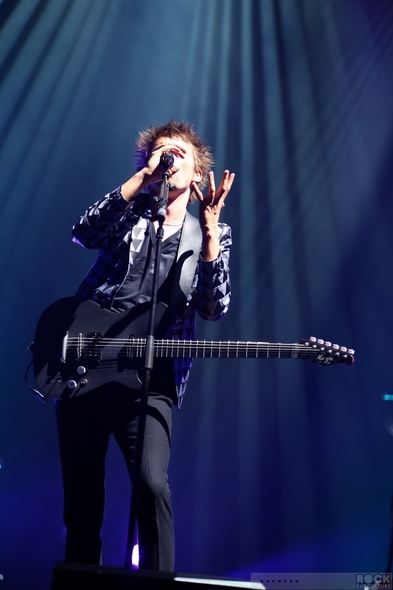 It’s really a fantastic song that blends so many different genres and sounds, I just can’t get enough of it – sheer genius. 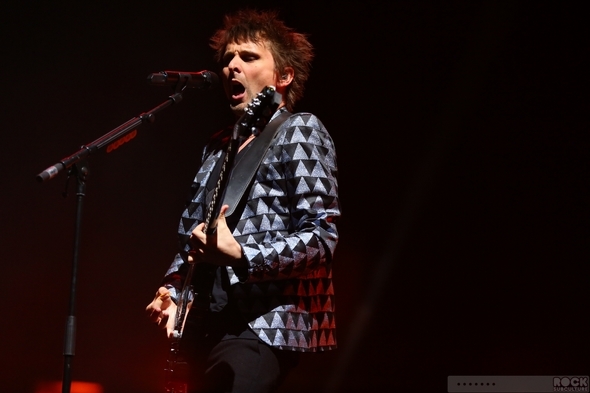 I’m hopeful that it will be released as an official single in 2013 so that I can place it in this years list, but more because its for sure (again, in my opinion), one of their best songs from any album that they’ve released throughout their career. 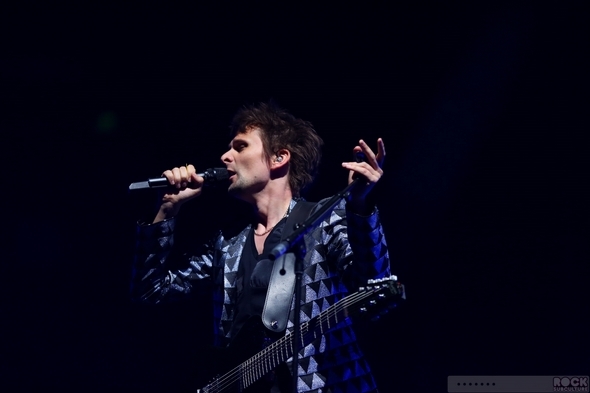 So, getting back to last night’s concert, it was really quite flawless, and left me wanting for nothing. 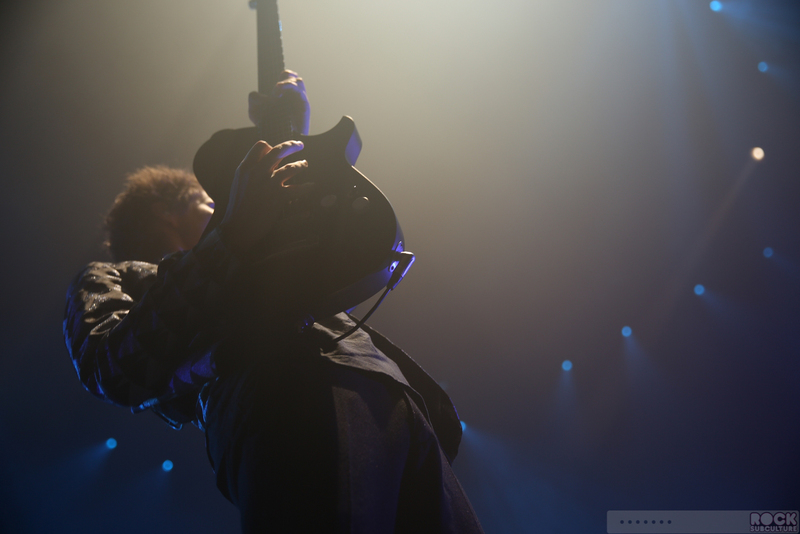 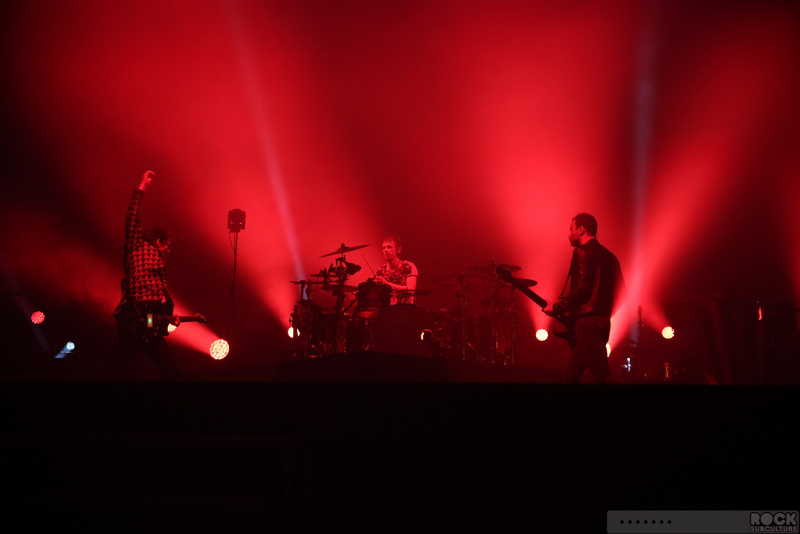 The guys are simply amazing to watch as they recreate their complex art on stage, and make it look quite easy as well. 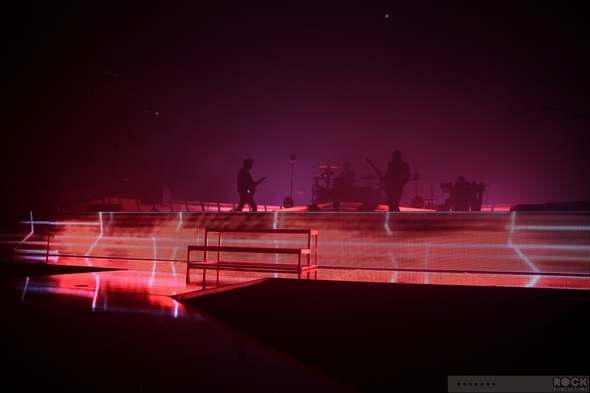 The sonic awesomeness that they deliver is incredibly matched by the spectacle of their high tech stage, which compliments the tone and theme of the songs perfectly. 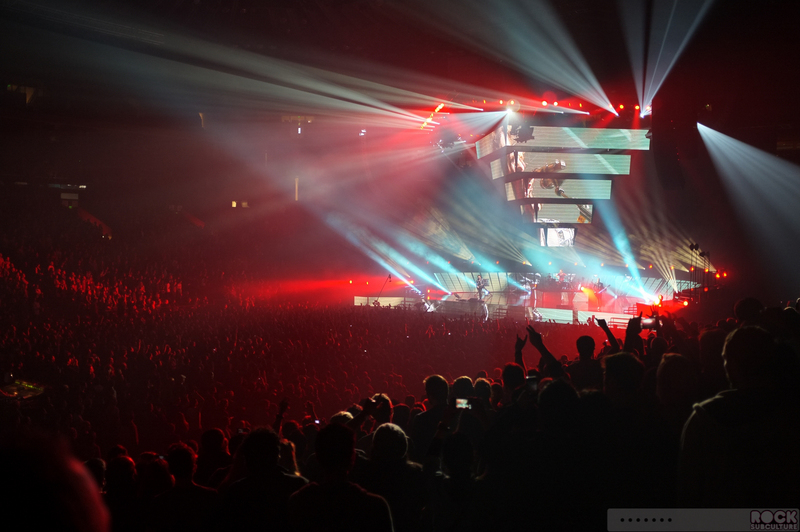 Genius music matched with impeccable and inspiring design, that also suits their playing style perfectly. 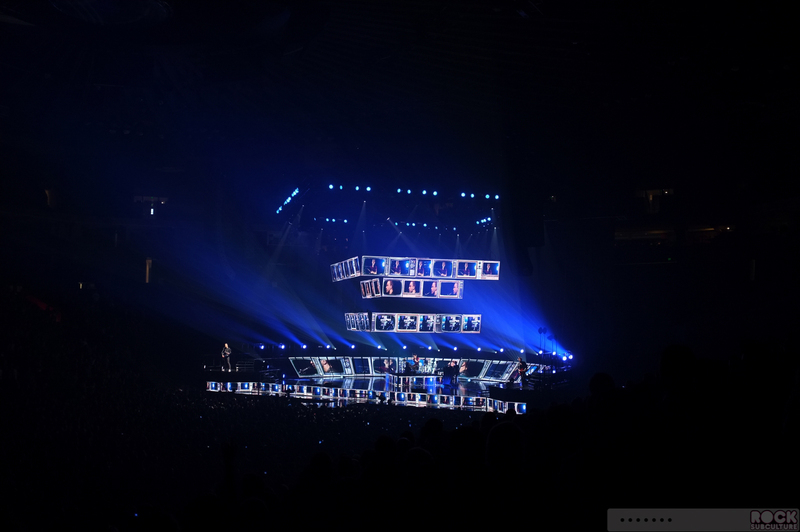 After I shot the first four songs, I sat with a friend up in the side rear part of the stadium, and it was awesome to see the show from that perspective as well. 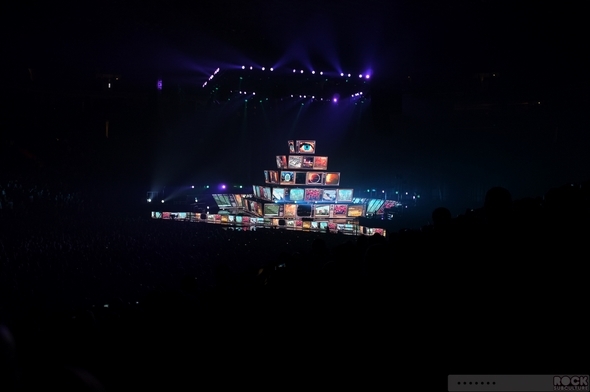 I was also positioned to be able to see the monitors down in the mixing station, as crew picked from the many high quality, high definition hidden video cameras on stage fed the footage back to them to feed back into the monitors on the stage – in the transforming pyramid, the walls behind them, under them, all around. It was simply awesome, and my further description of it really won’t do it justice. 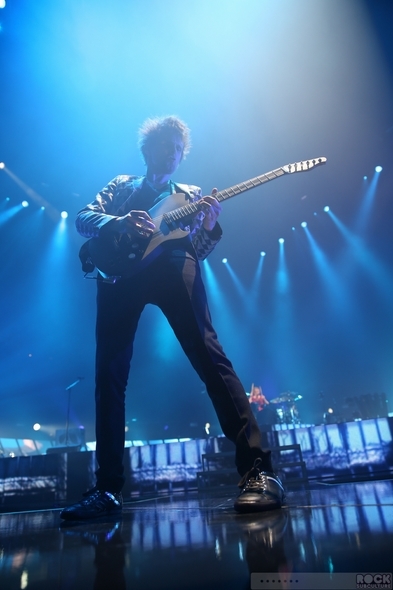 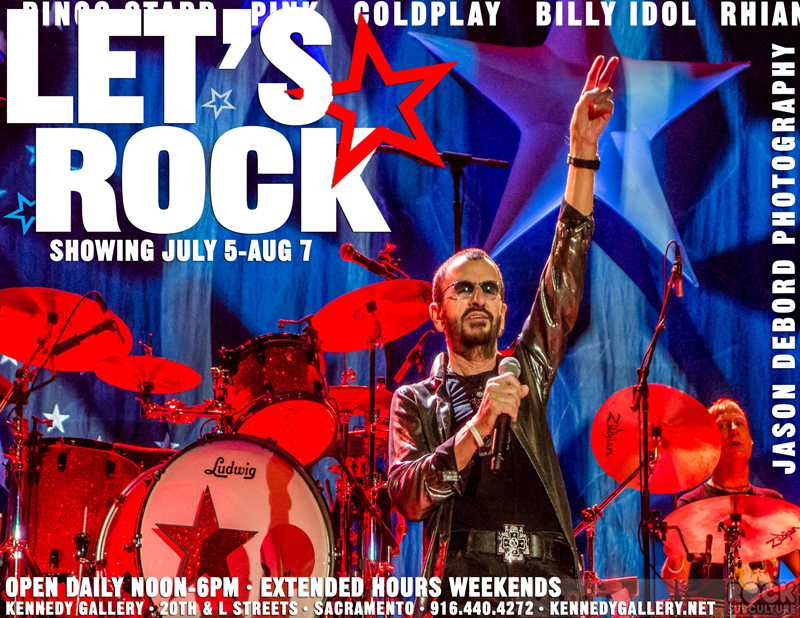 This is really a show that anyone with any interest in Muse should go check out. Amazing. And huge credit to the behind the scenes team that make the spectacle part of the show happen. 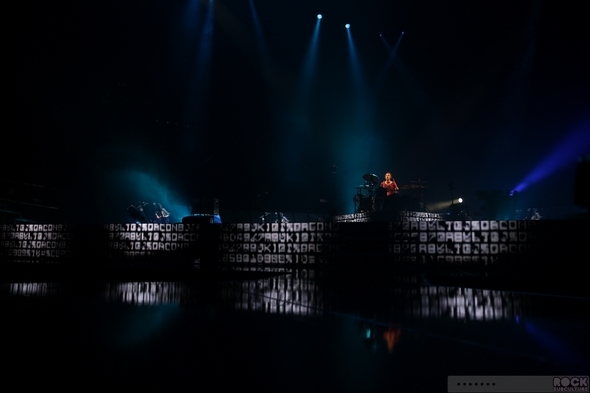 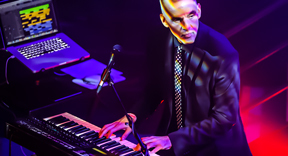 The band is full of surprises though, as they have so much electronic and synthesizer and keyboard and effects built into their music, that you would think much of it would be pre-recorded, but they do an amazing job recreating it on stage. Further to their credit, they change up their set list each night – even with all of the work that goes into the displays and what is going on with the stage. 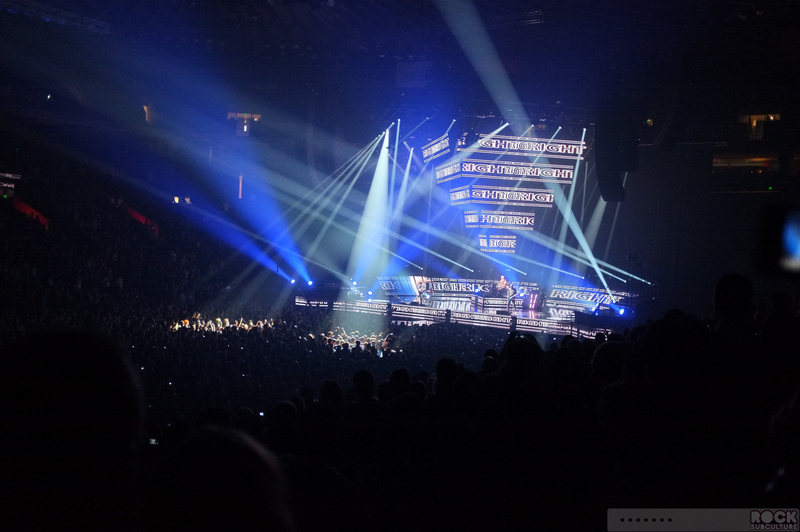 Amazing show last night, and I’m really looking forward to seeing it again in Sacramento at Sleep Train Arena tonight. 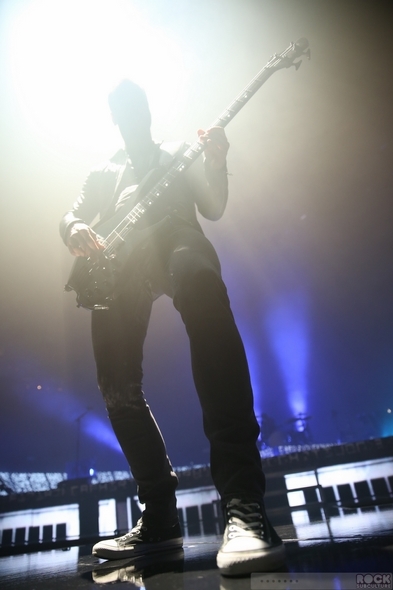 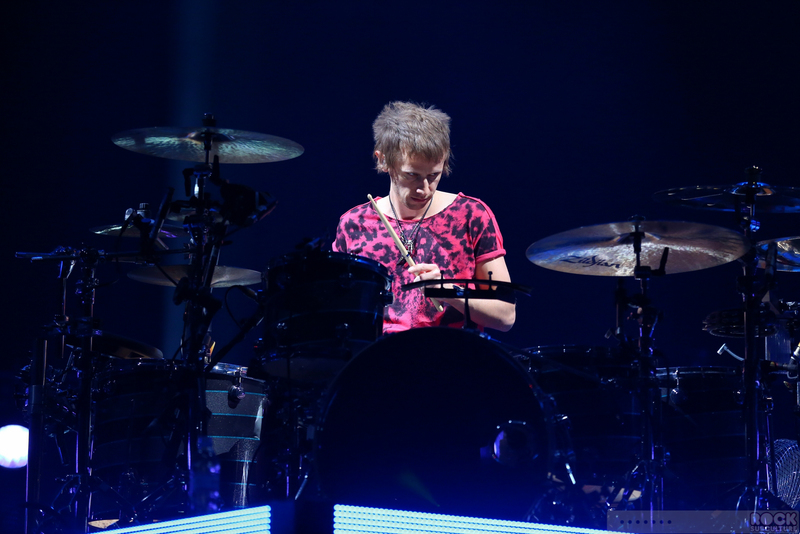 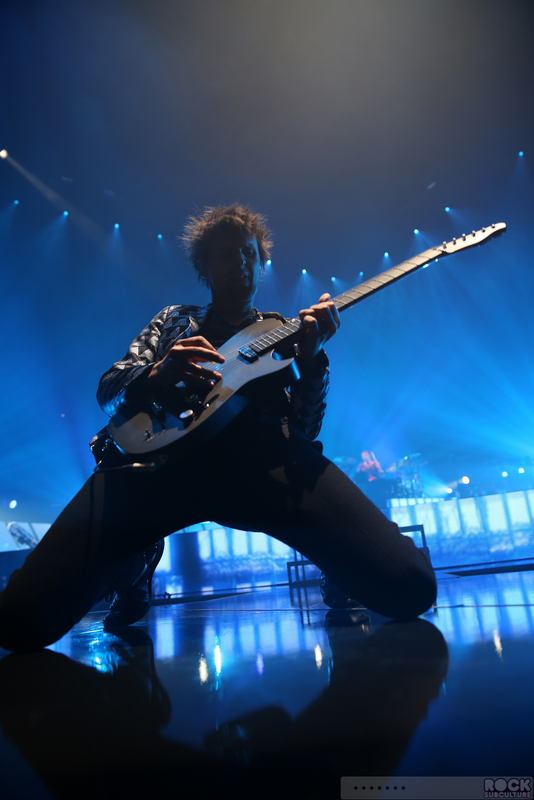 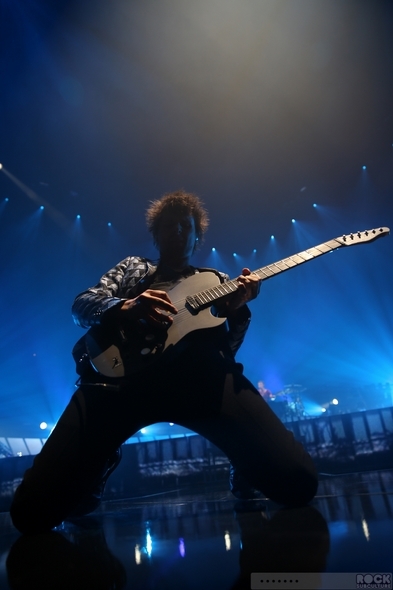 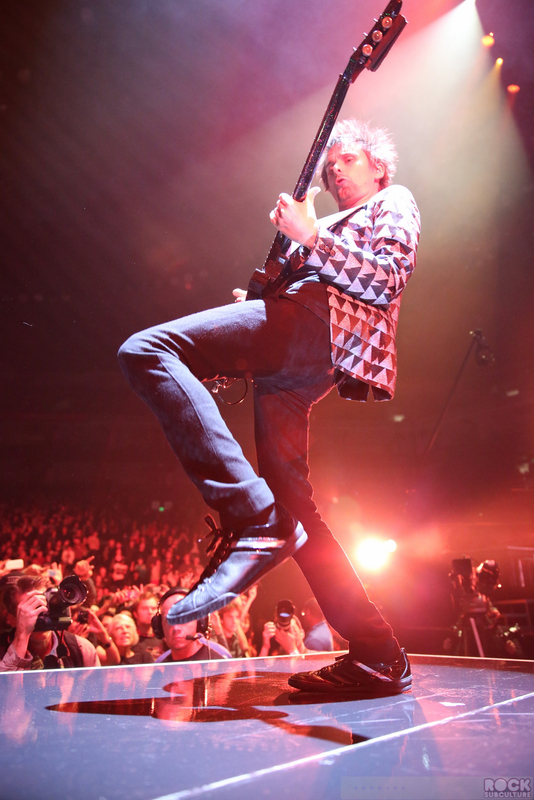 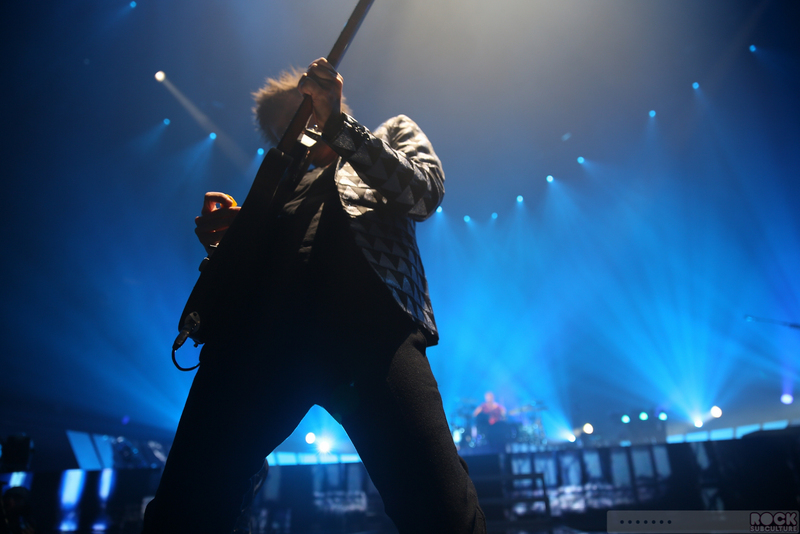 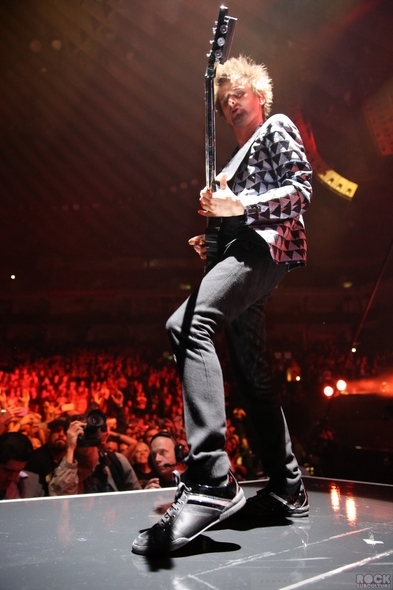 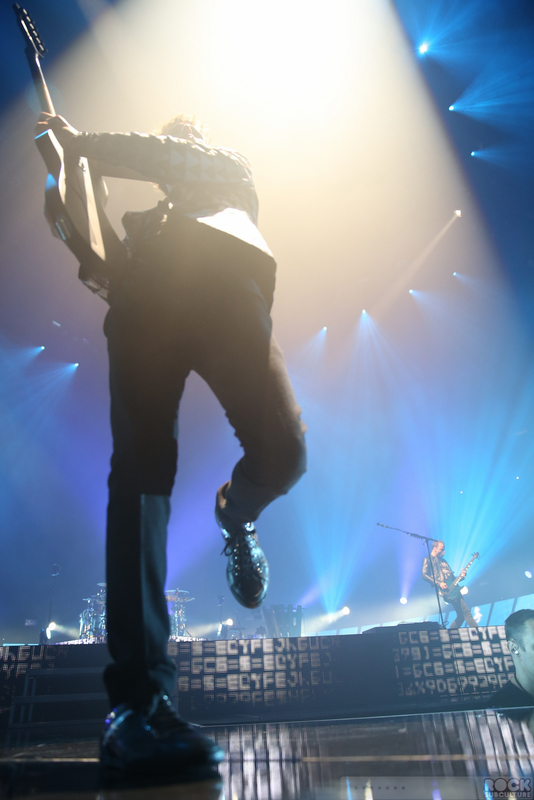 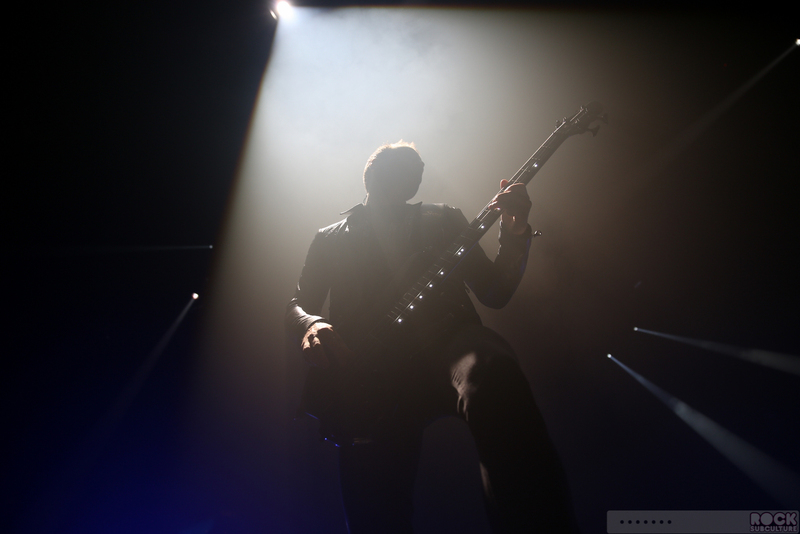 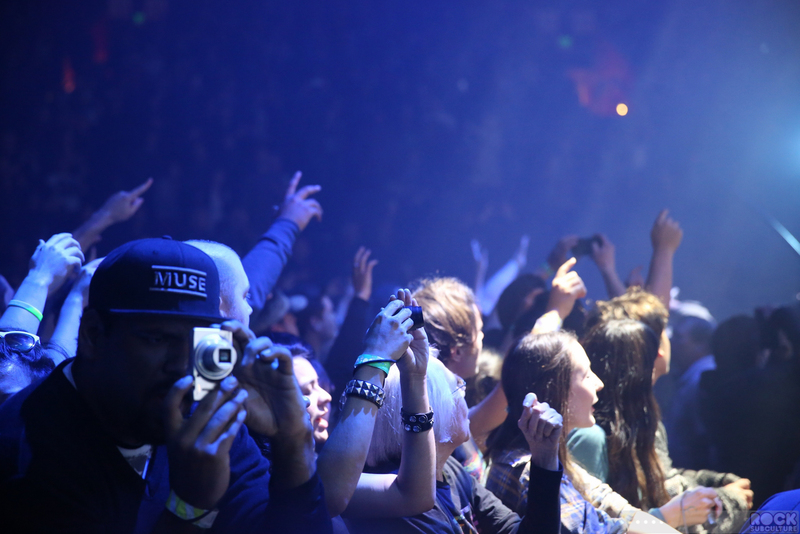 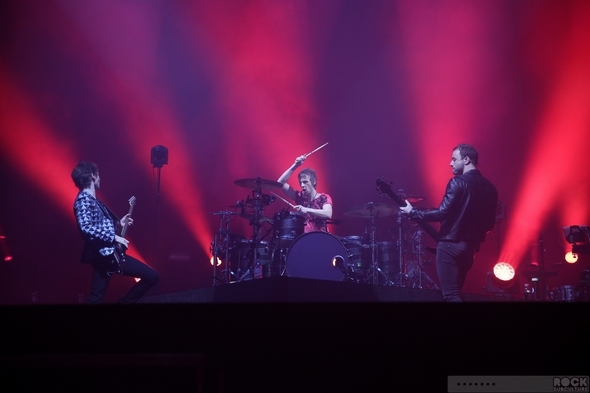 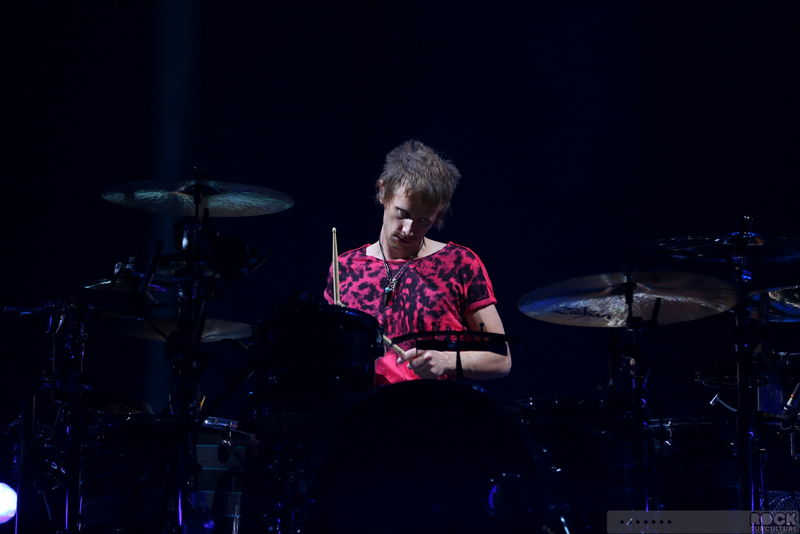 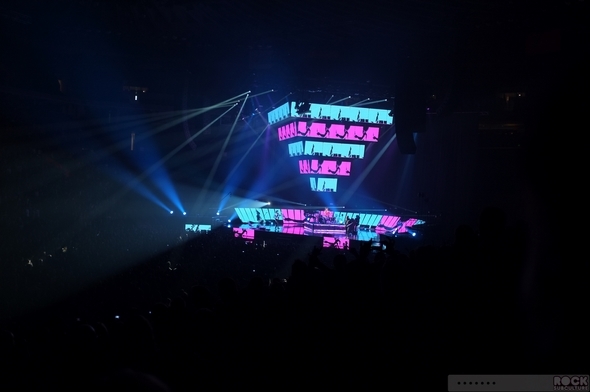 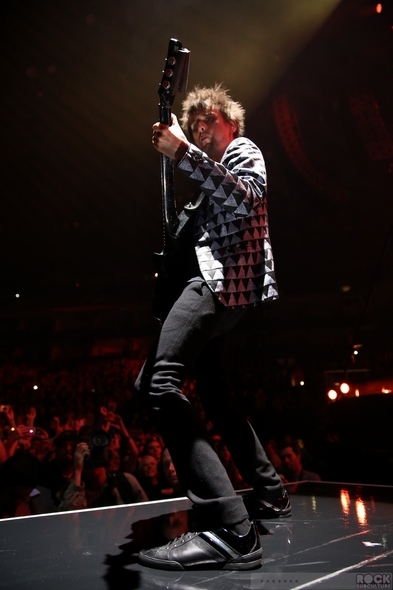 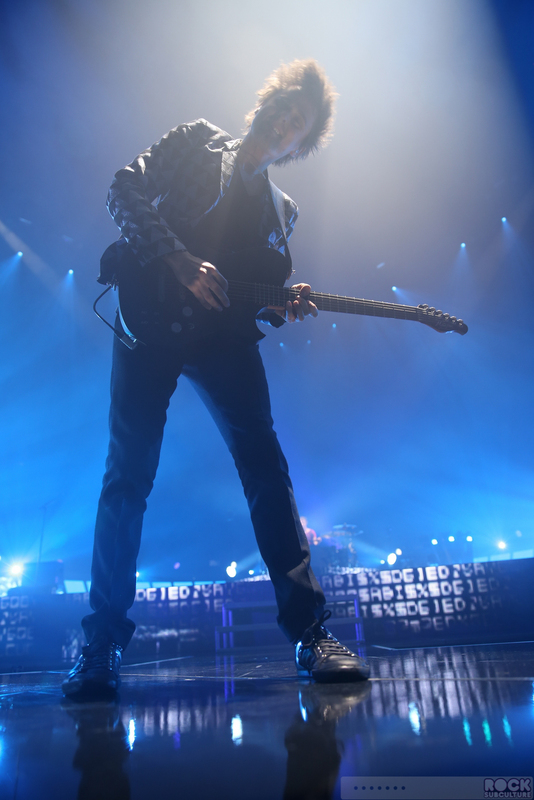 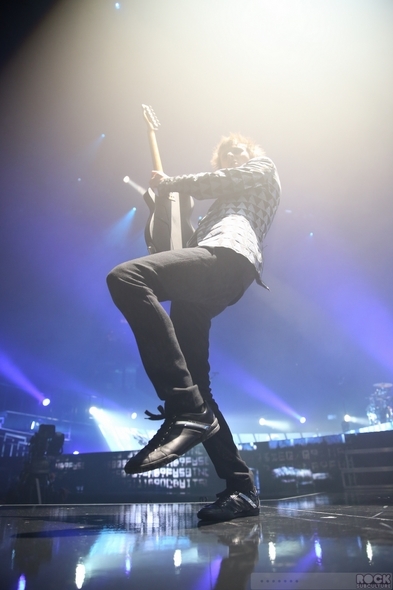 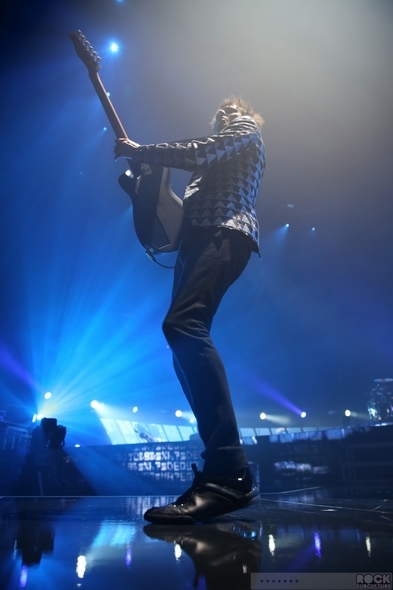 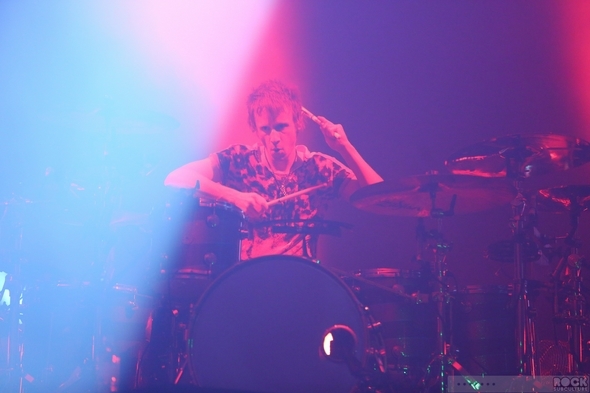 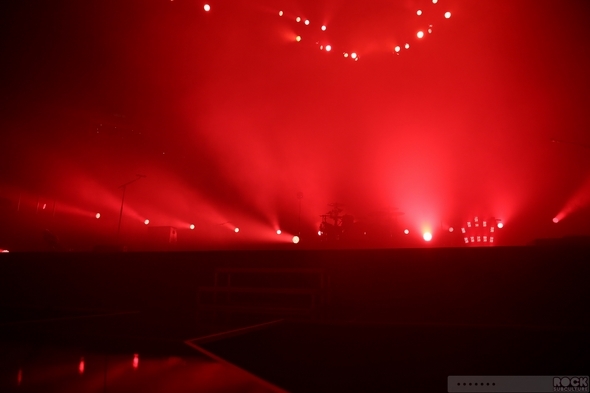 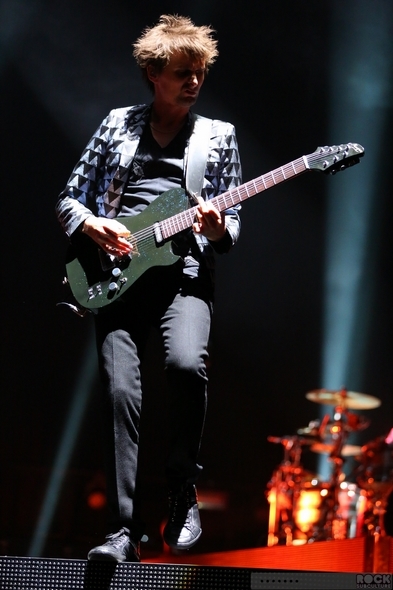 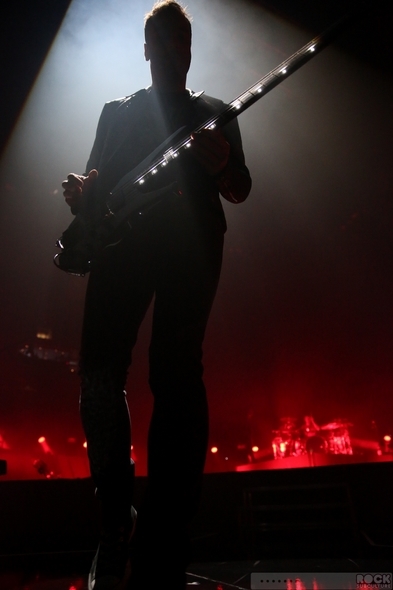 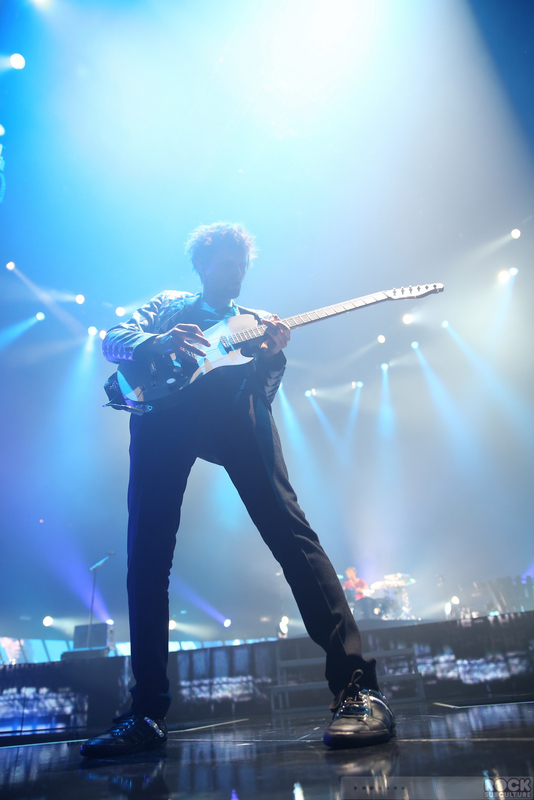 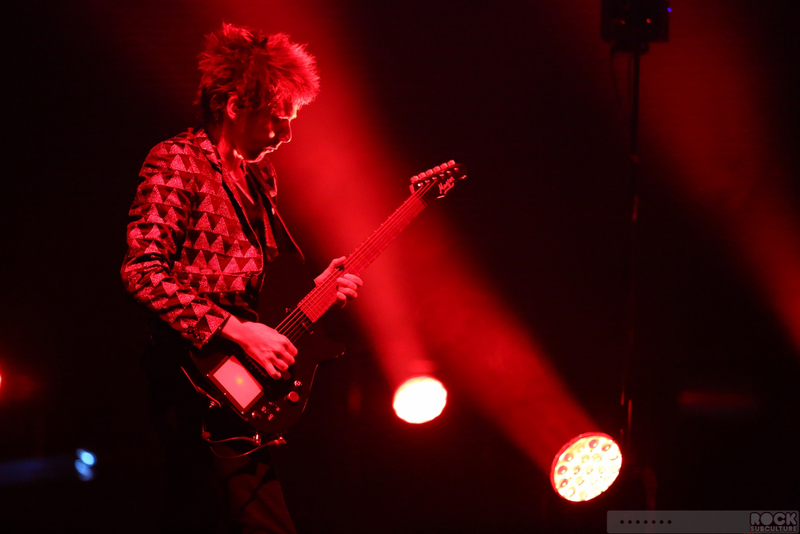 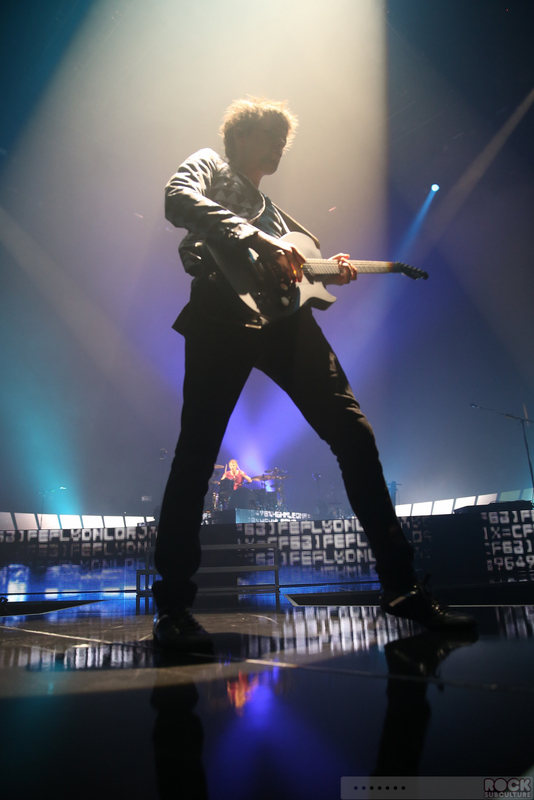 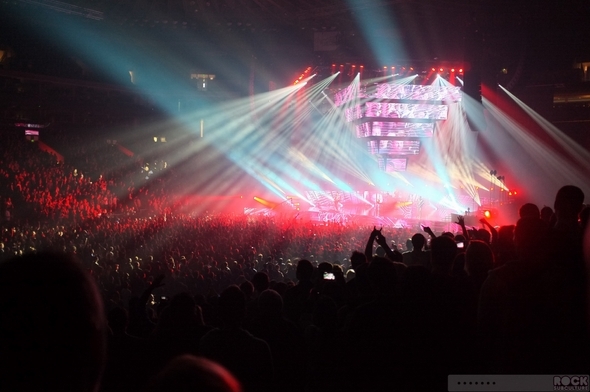 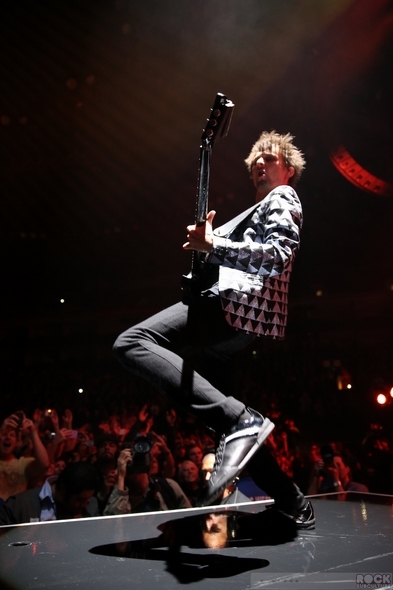 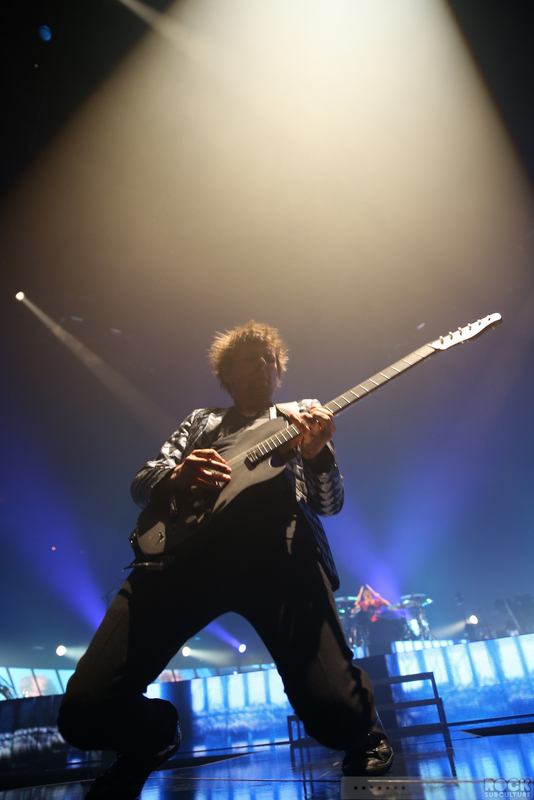 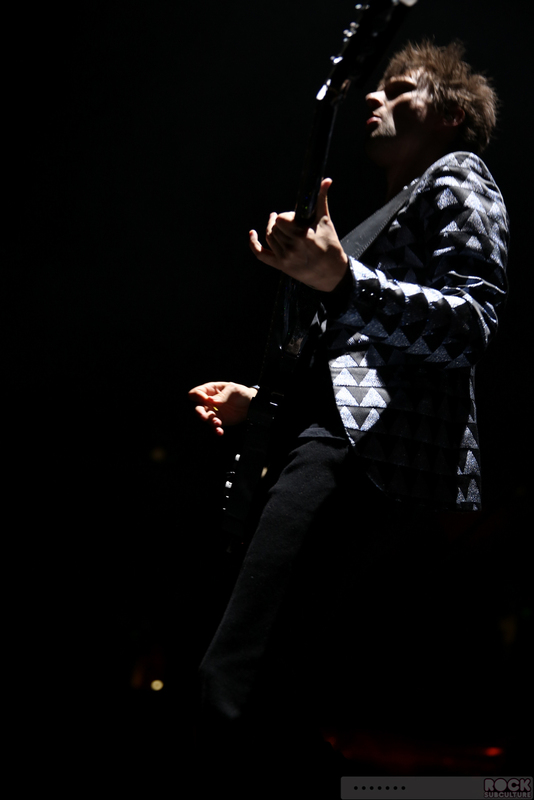 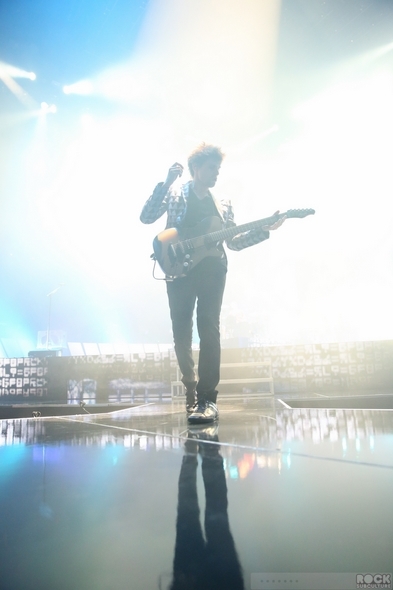 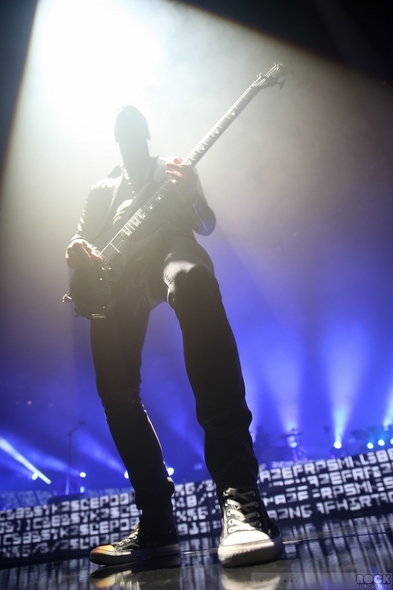 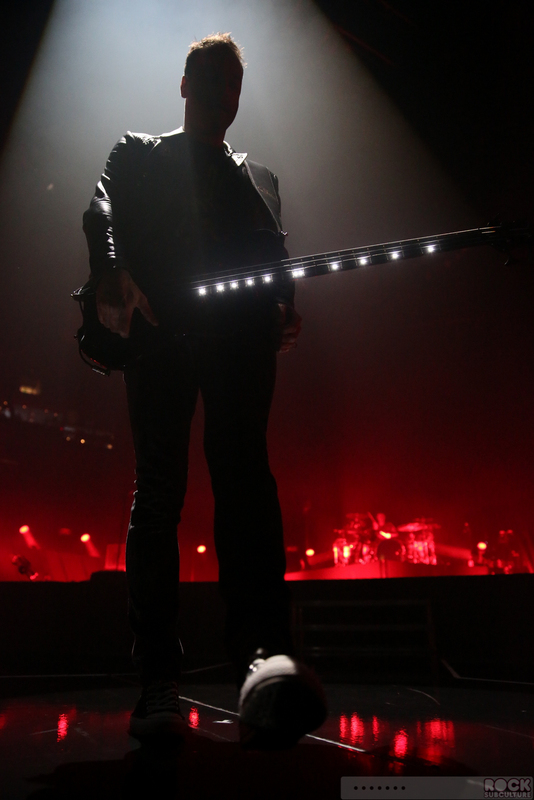 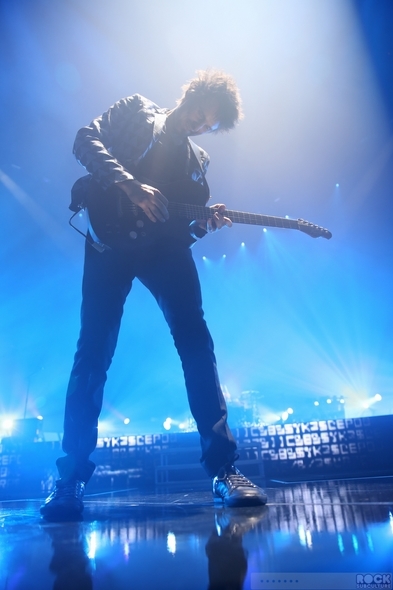 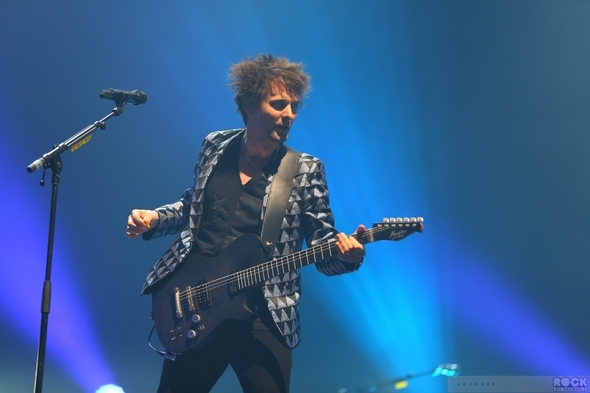 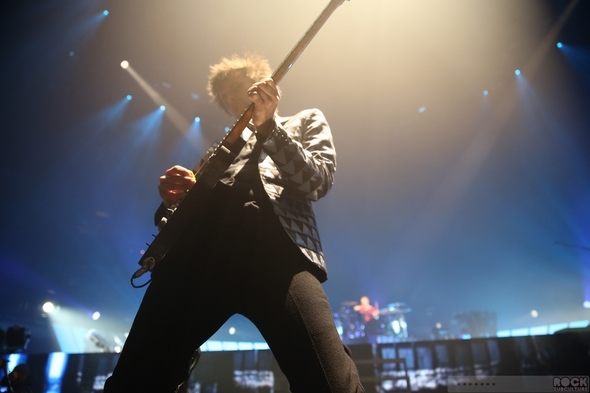 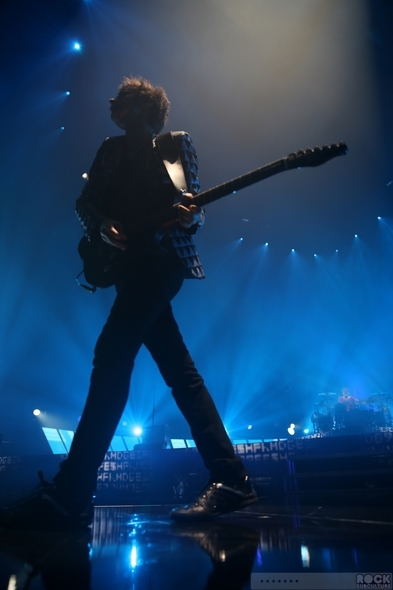 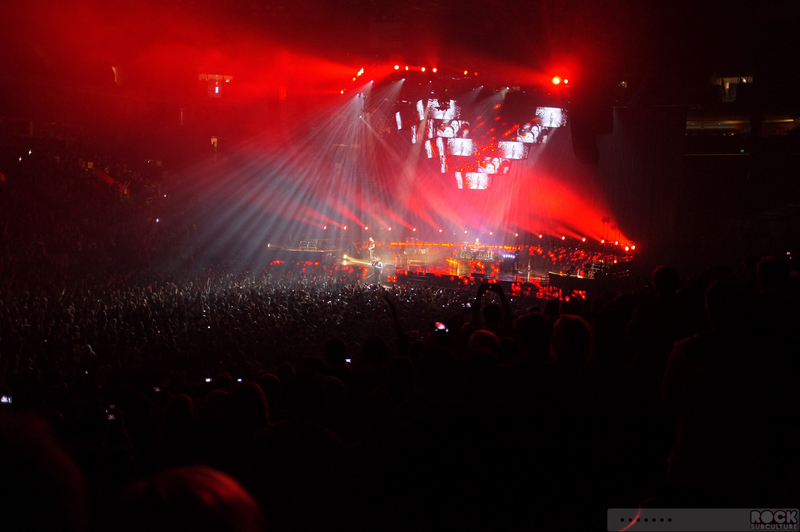 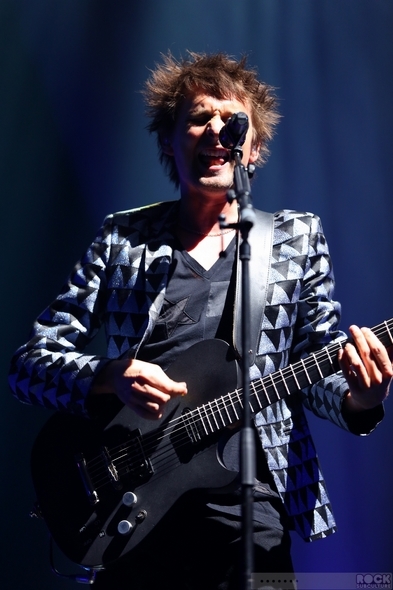 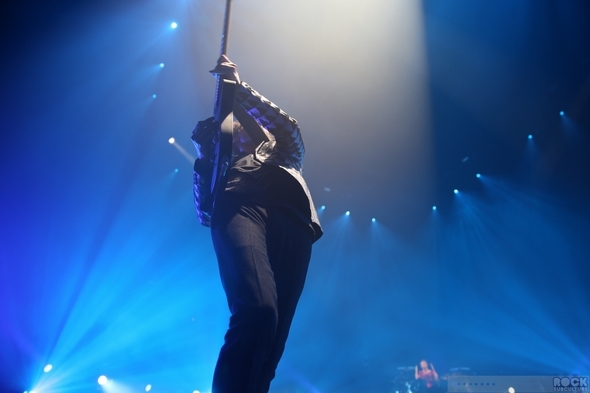 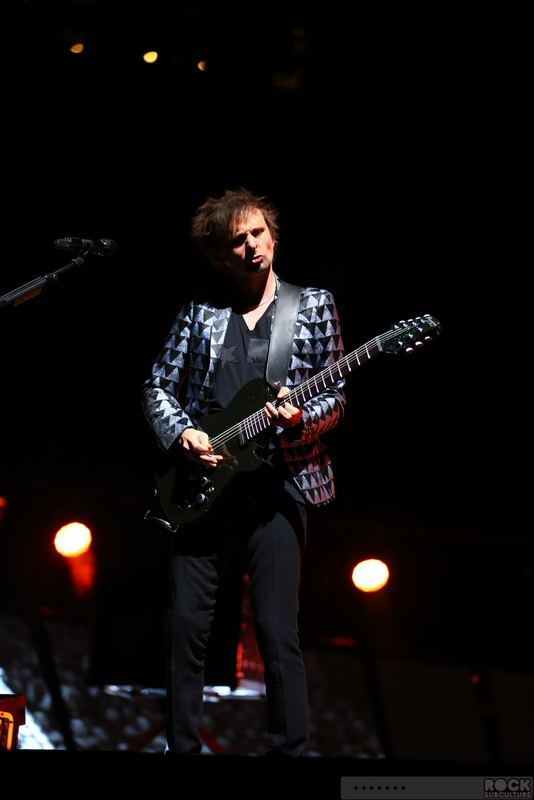 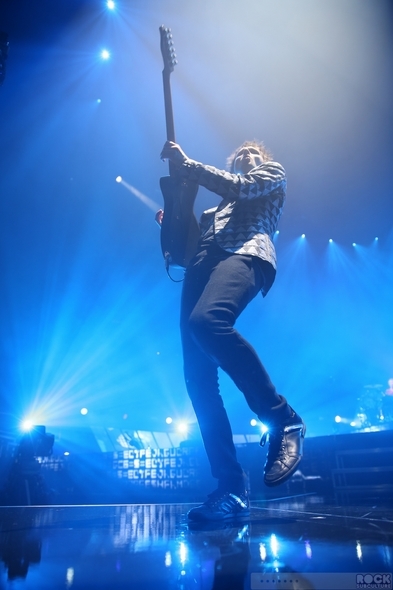 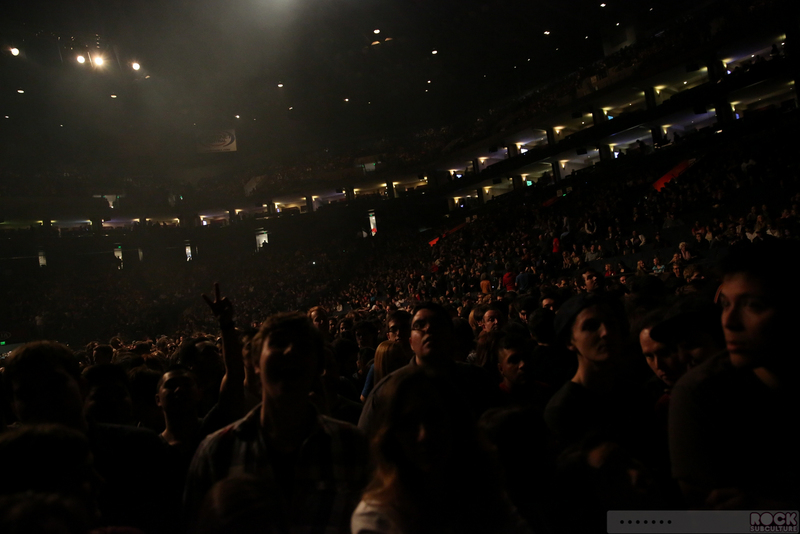 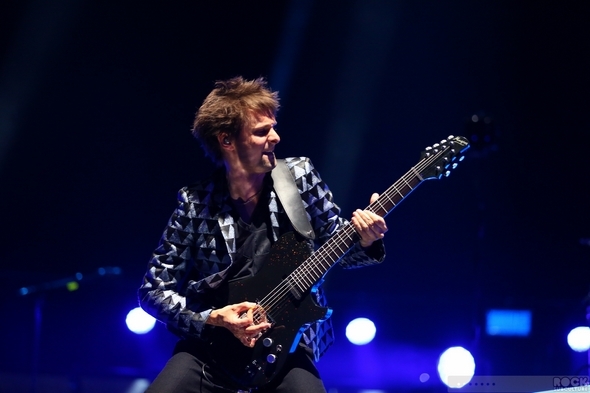 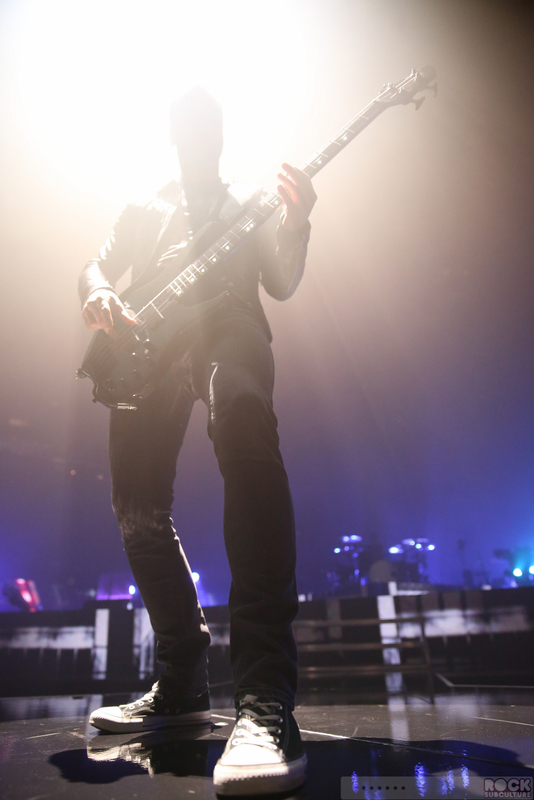 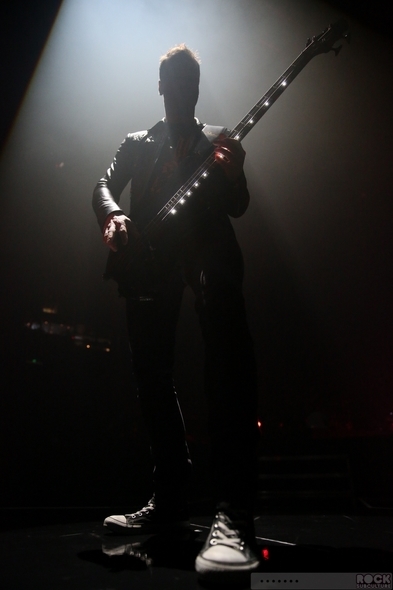 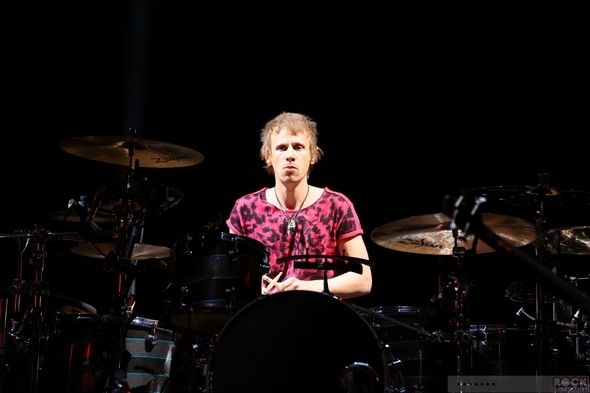 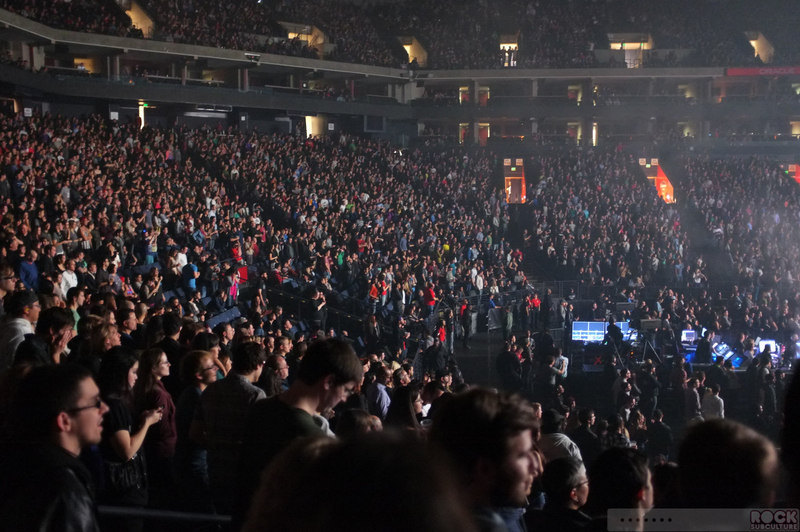 Below are some photos of Muse performing on stage (click any image for higher resolution). 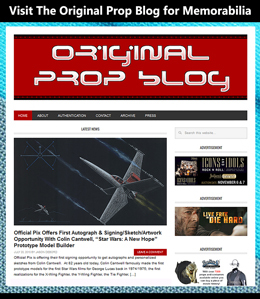 Please also note all images are copyright, all rights reserved, and cannot be reproduced or used outside of this website. 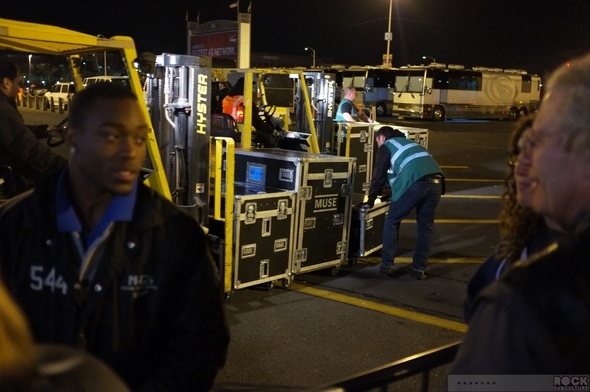 Additionally, all photos taken outside of pit were done with a pocket camera.